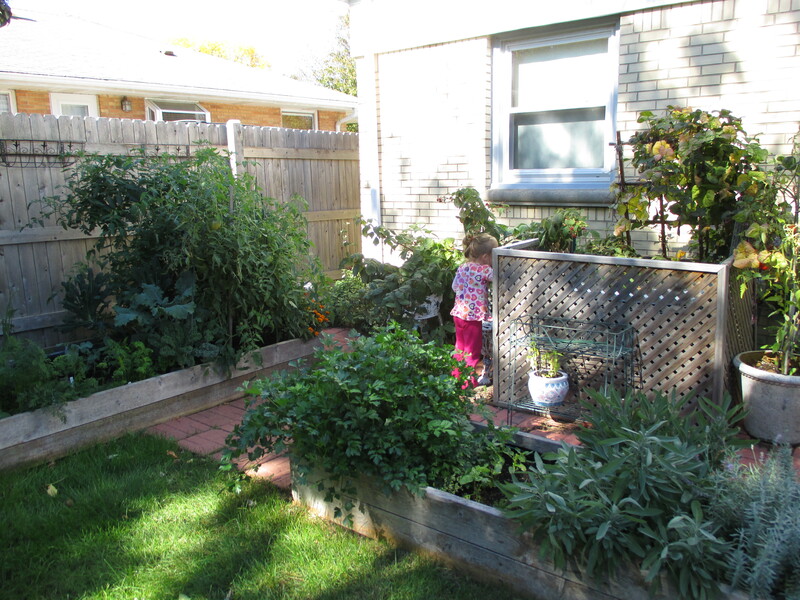 My garden space is limited. 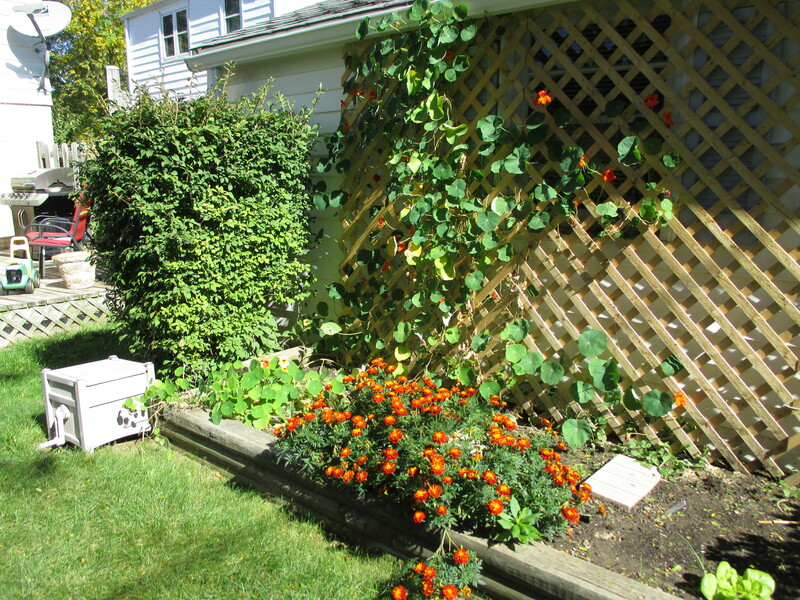 I only have so much usable space, so I’m careful to make the most of it throughout the growing season. 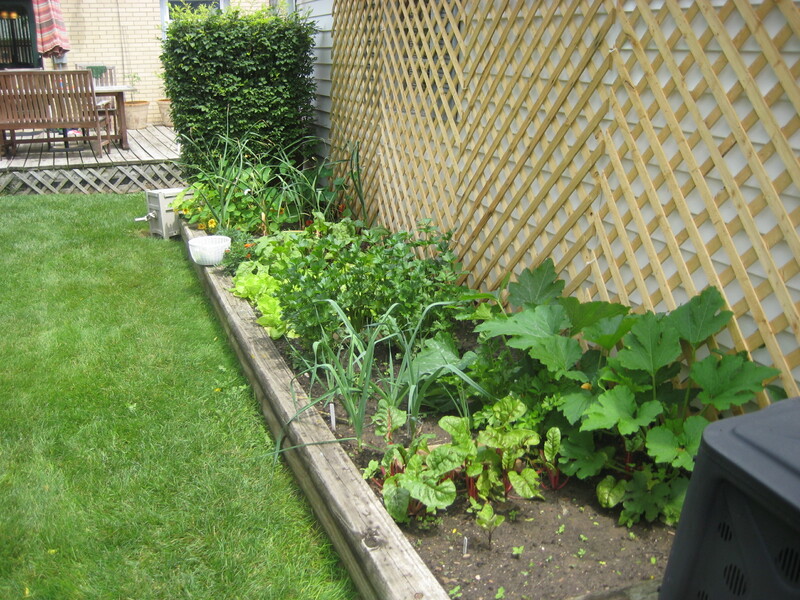 I keep three goals in mind for my garden: variety, quality, quantity. 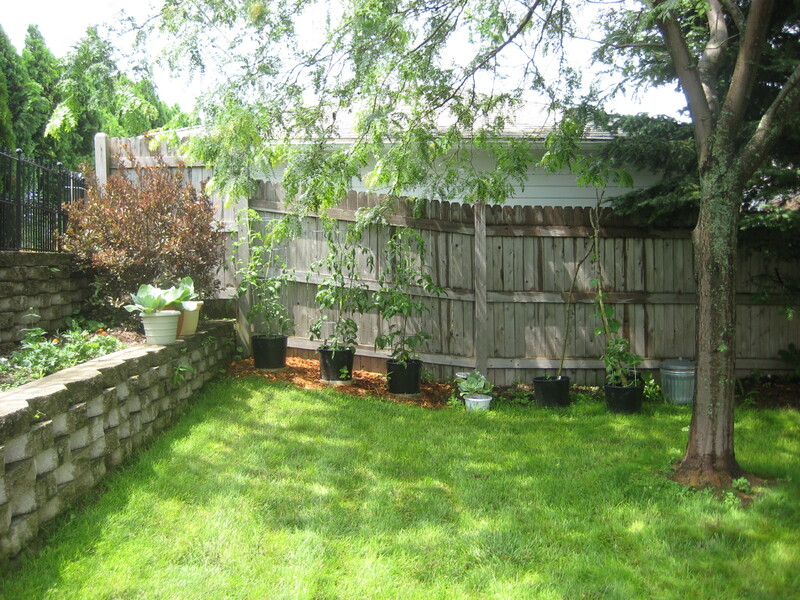 Now I know I could plant all my space with peppers and tomatoes and I’d surely have quantity. But I wouldn’t have variety. 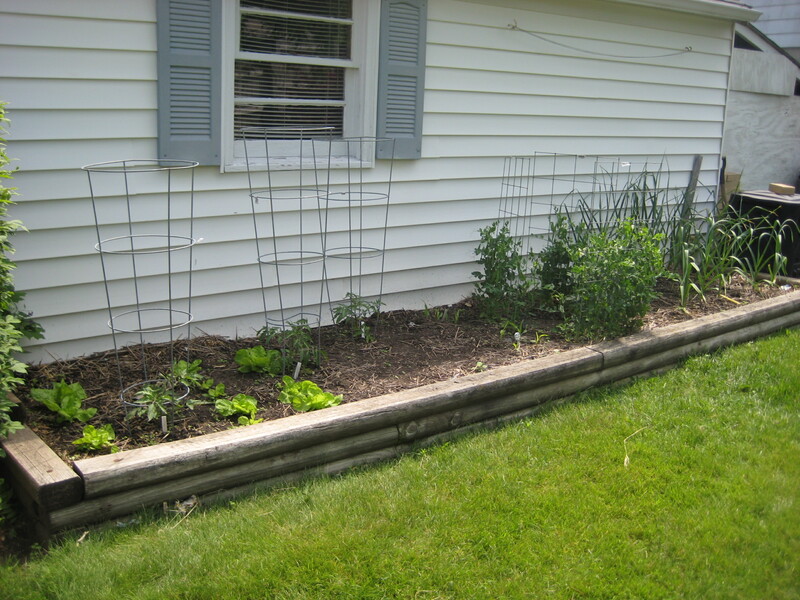 Or I could always plant the tomatoes in the one space that I really like to put them, but that might risk quality because tomatoes (and most other crops) benefit from being rotated to different spots in the garden–that way pests and diseases are deterred. 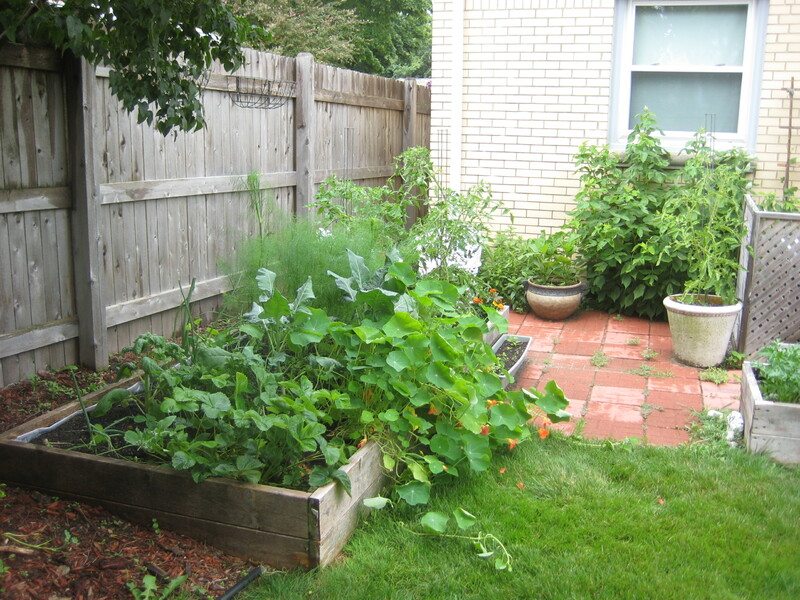 To maintain my three goals I really need to plan for a full season of growing in which my space is used wisely. Most of my spaces are planted twice–once early in the season (or in the fall, depending) and again later on when the first crop is harvested and the space becomes available. 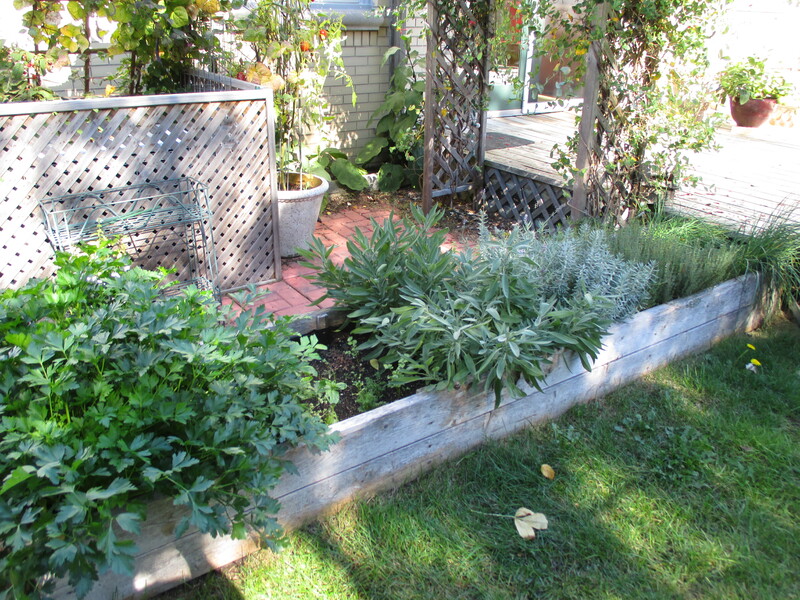 In the two photos you can see the difference between the early season in this garden bed, and how it currently looks. 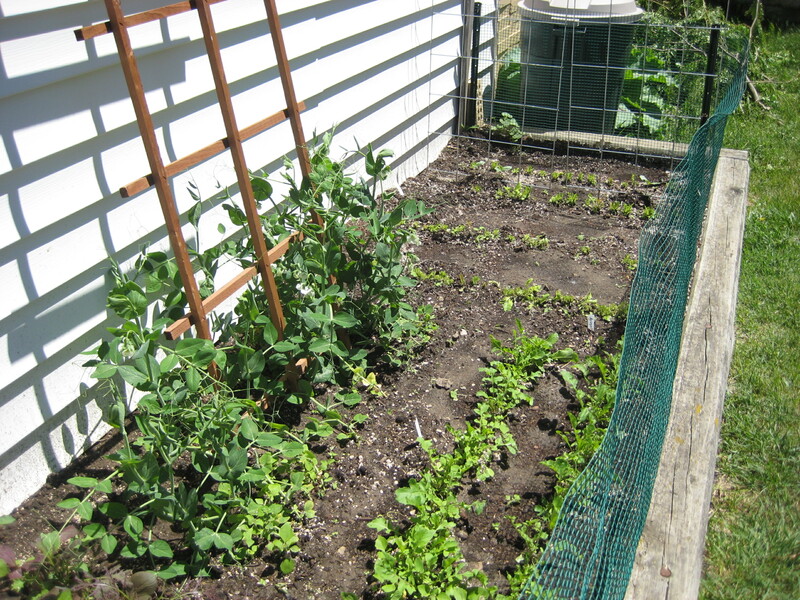 Earlier this season I had it planted with radishes, lettuce, peas and garlic. 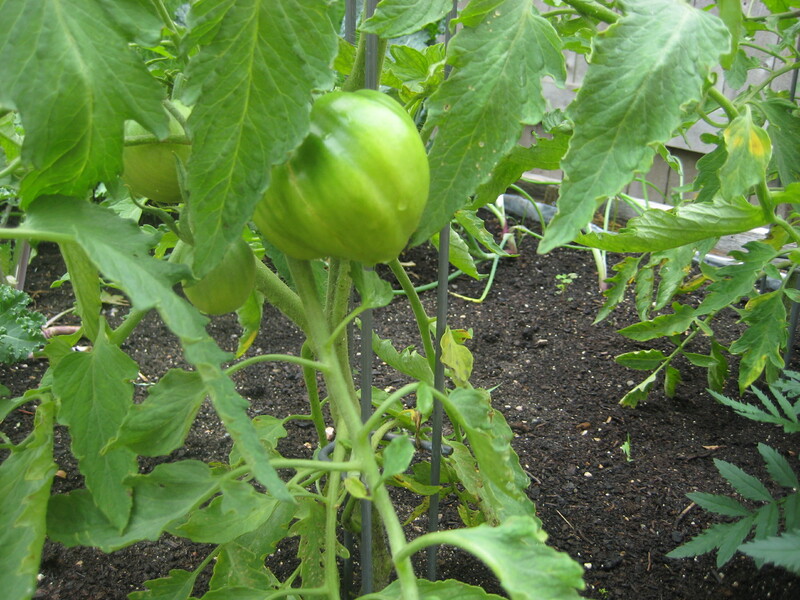 The tomatoes were also in the garden at the time I took the first photo. 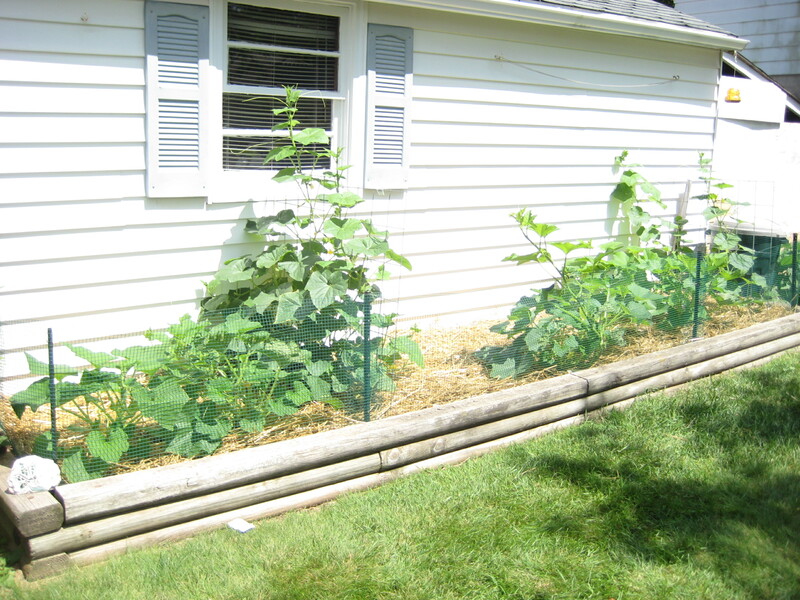 The second photo shows that all but the tomatoes are now gone, and instead it is filled with corn, beans, squash and cucumbers. 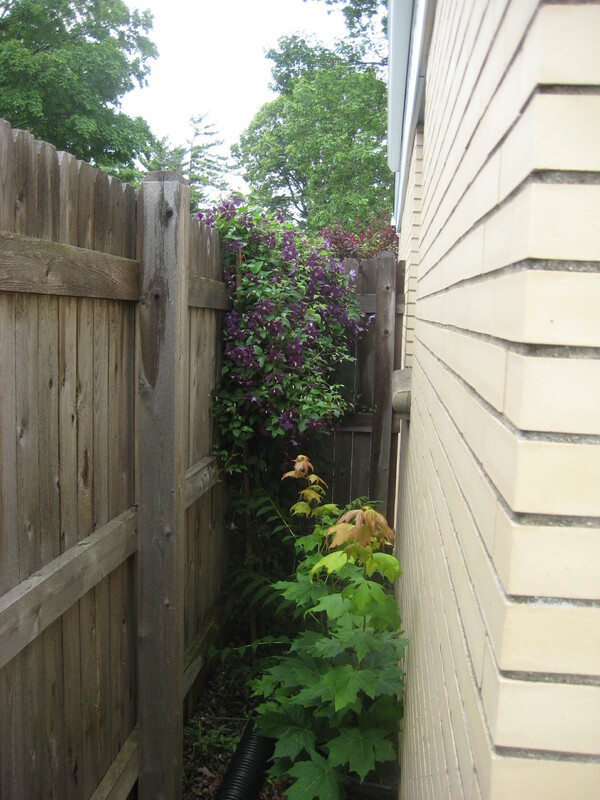 Other areas of my yard get the same treatment. 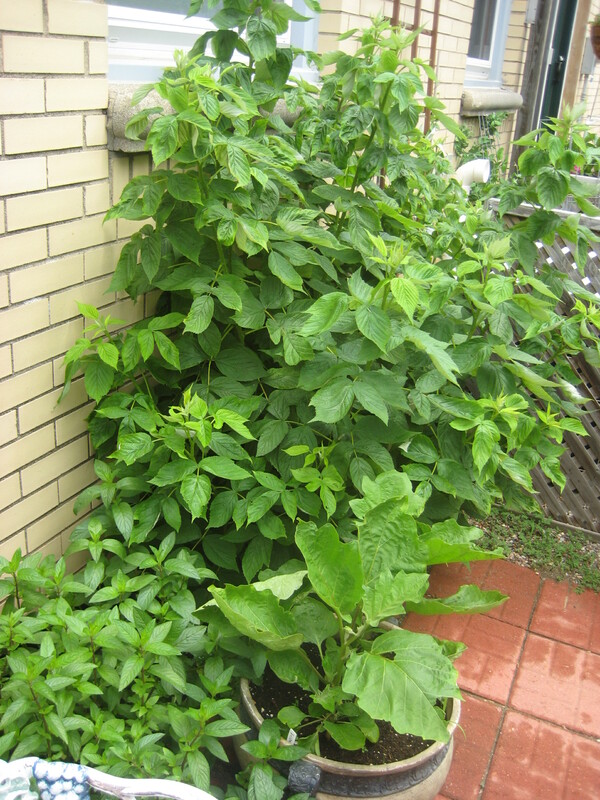 Where I had beets in May and June I’m now growing ground cherries. Where I had arugula this spring I’ve now got basil, dill and cilantro. The bed that had tulips for cutting is now filled with tomatoes, fennel, cabbage, leeks, beets, carrots, beans, celeriac and peppers. 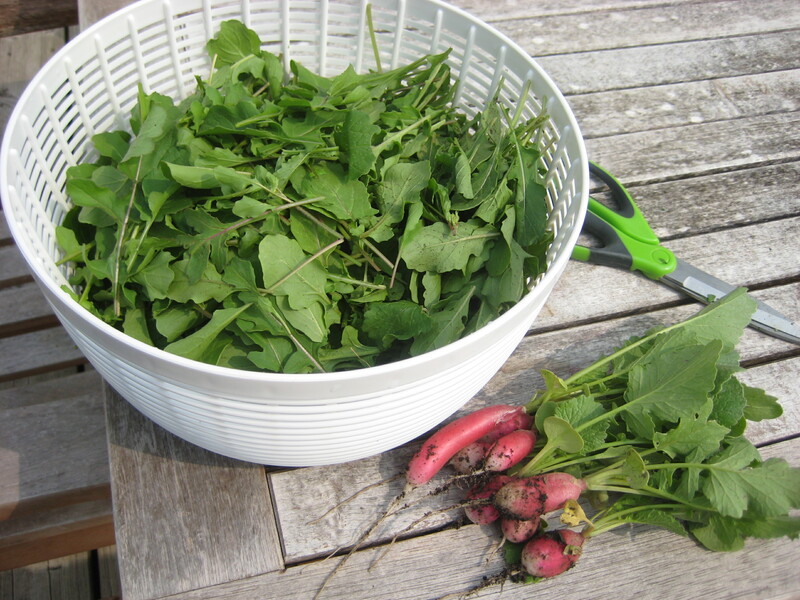 Earlier in the season that same bed had radishes, arugula and spinach. 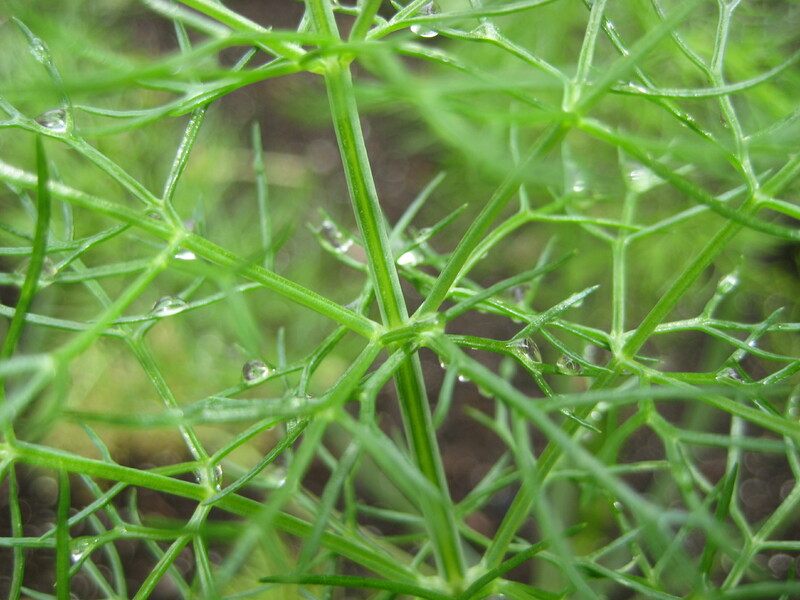 And in a week or so when the fennel is harvested I’ll be planting kale and more spinach. 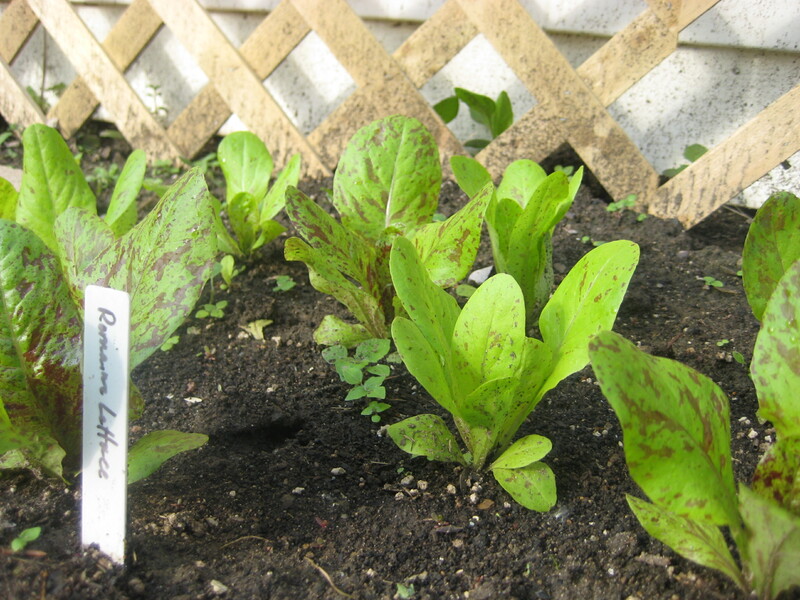 In my garden I’ve planted spinach twice already this year and plan to do it again! 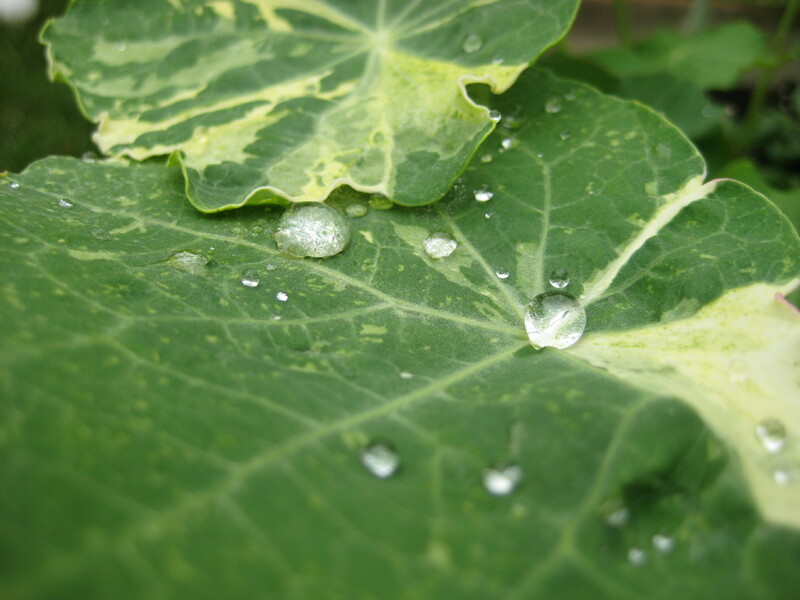 Pots with nasturtiums will soon be planted with lettuce. 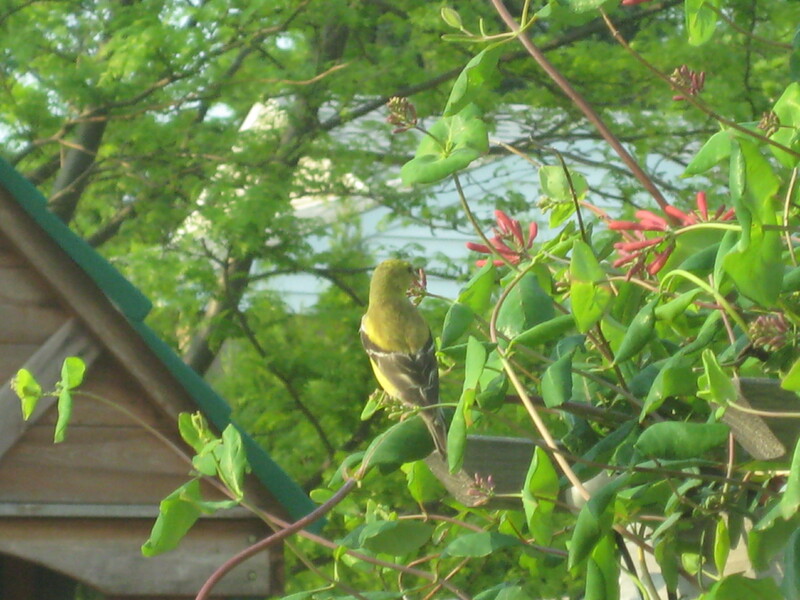 My garden definately has variety. 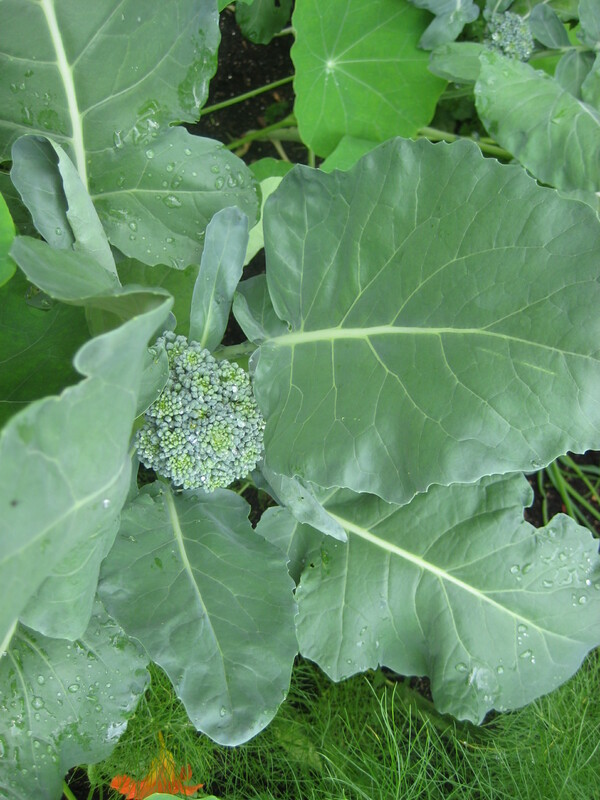 I garden organically, so the quality of my produce is high… maybe things have a few holes in them from sharing them with the insects that are in the garden, but nutritionally this homegrown stuff can’t be beat. And quantity? Well, I don’t get too much of one thing. I don’t always get to “put up” produce for later. 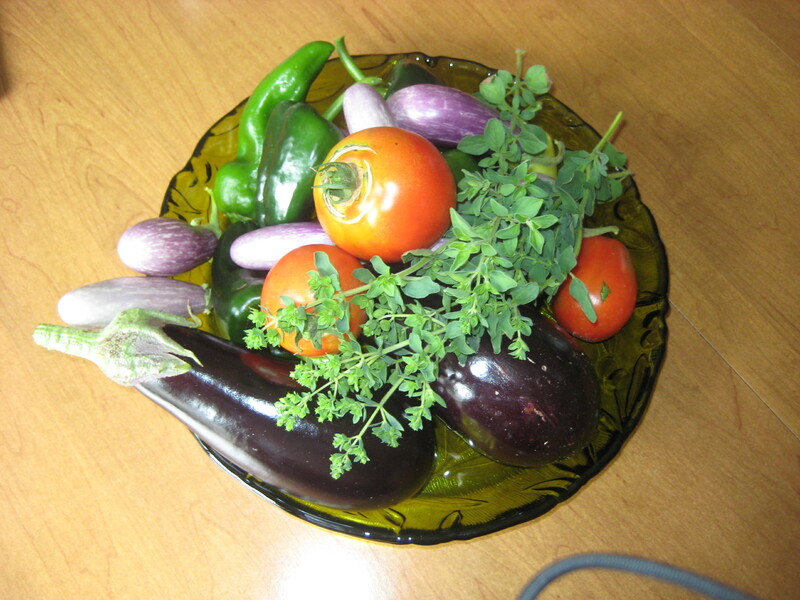 But there is plenty to eat from the garden and it’s in a rainbow of colors and flavors. 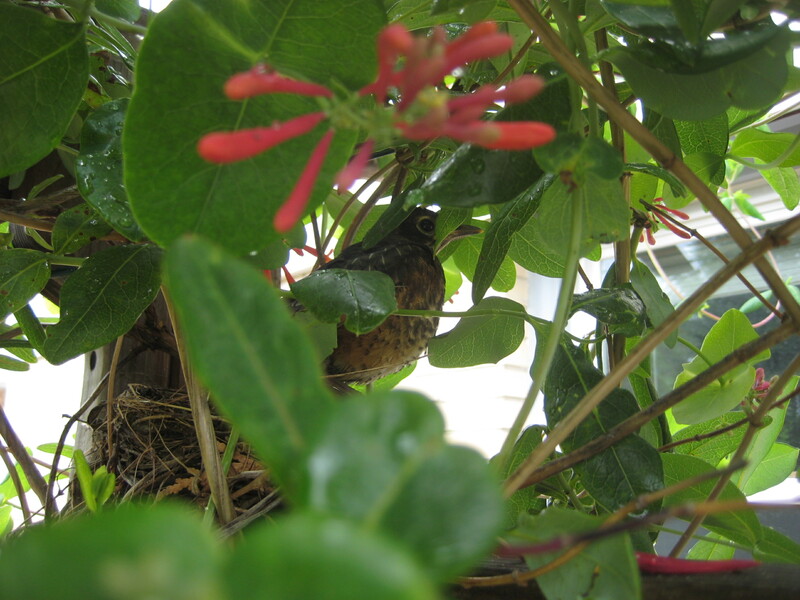 Photos from the last week of July. Colorful peppers. These are the Chinese Five Color, but apparently we are only going to get purple ones. They are lovely though! 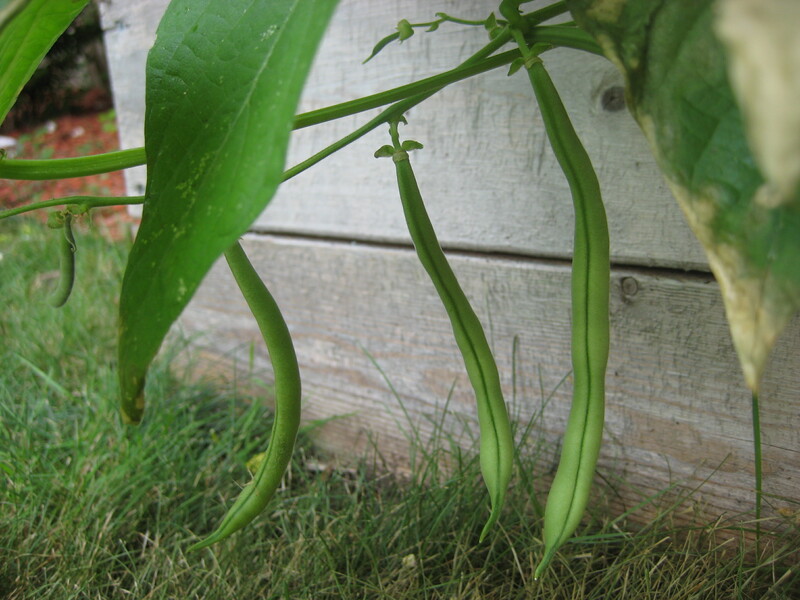 Beans hang from their vine, ready for pickin'. A look at my monster cherry tomatoes through the trellis. 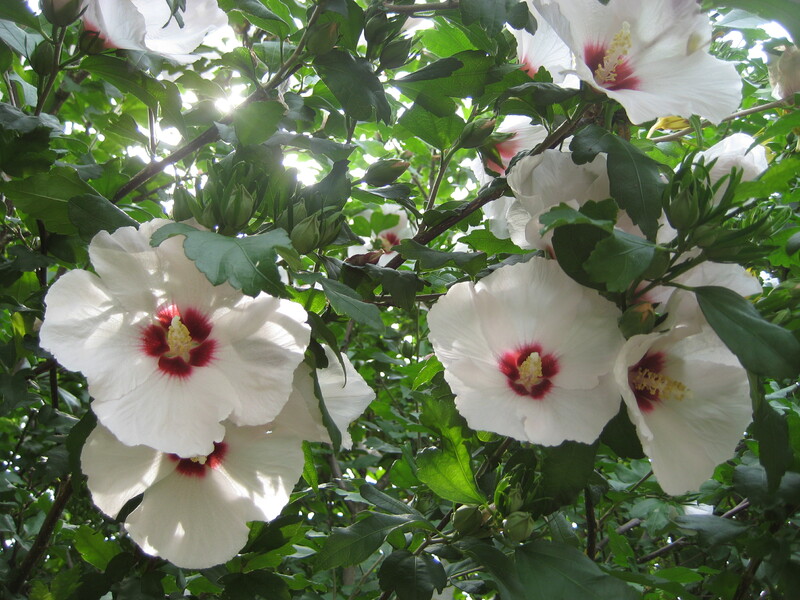 Rose of Sharon puts on a nice show. 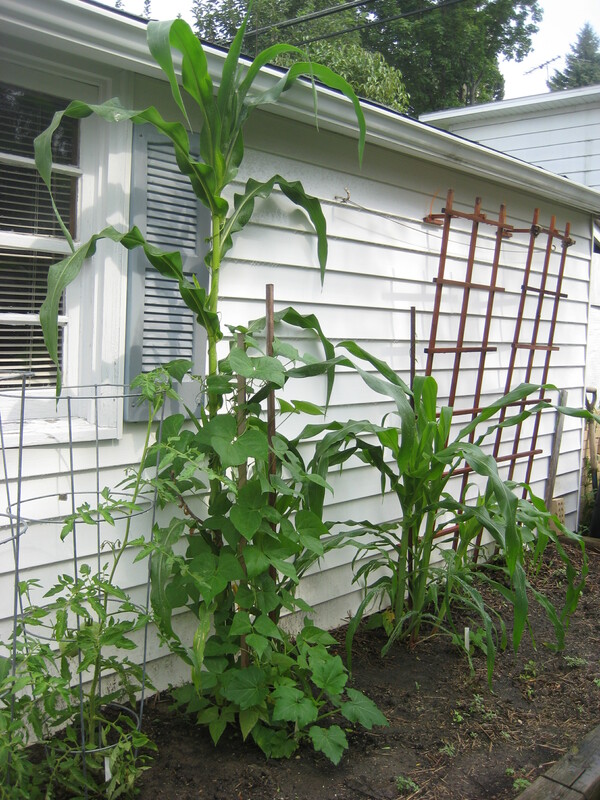 My attempt at growing the Three Sisters--corn, beans, squash--has been semi-successful. Very few corn survived my planting conditions and children trampling on them. 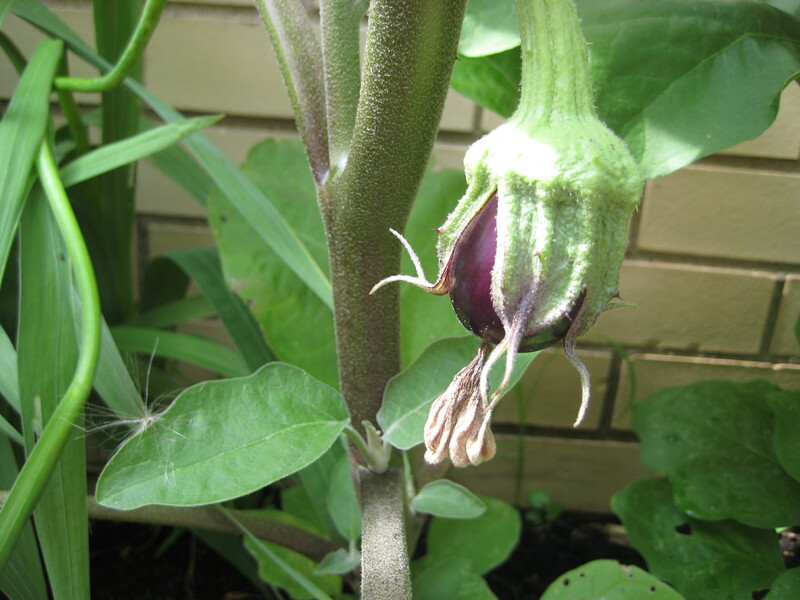 The first eggplant begins to take shape. 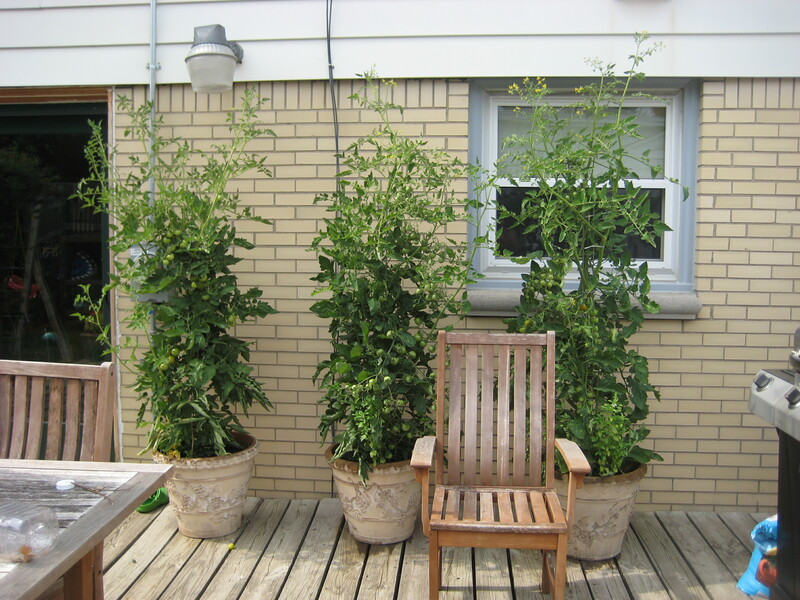 I put the chair there to show the enormity of these cherry tomato plants. From left to right: Tommy Toe, Black Cherry, Sun Gold. 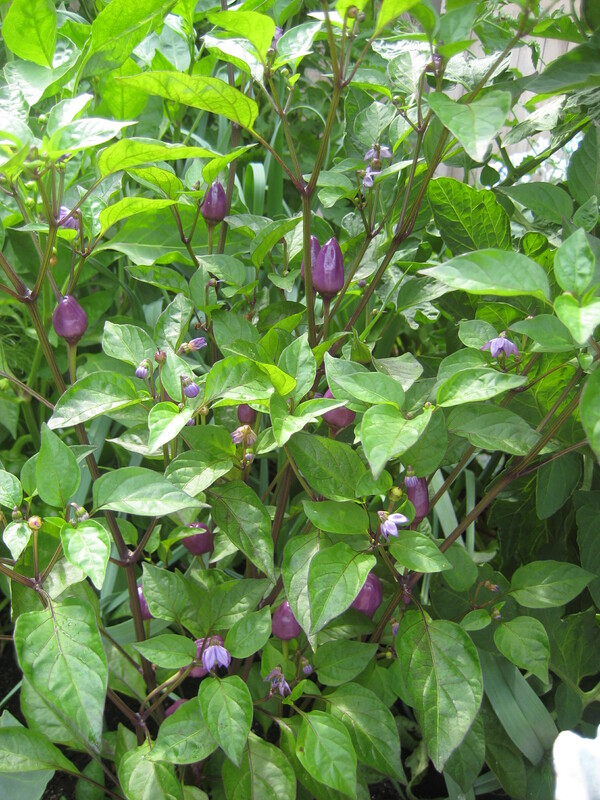 These are in regular potting mix--no added plant food of any kind. I believe they like the heat that radiates off the house. 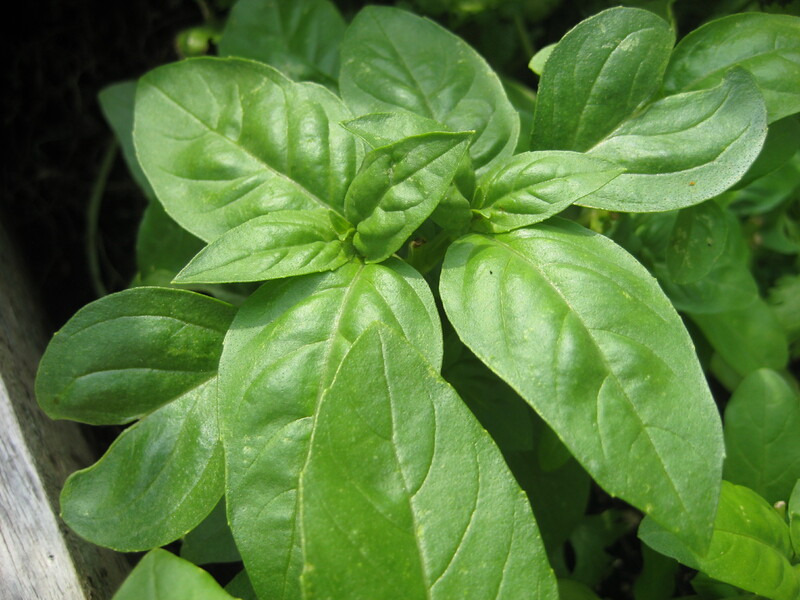 It's been perfect weather for basil, which means pesto is for dinner tonight! 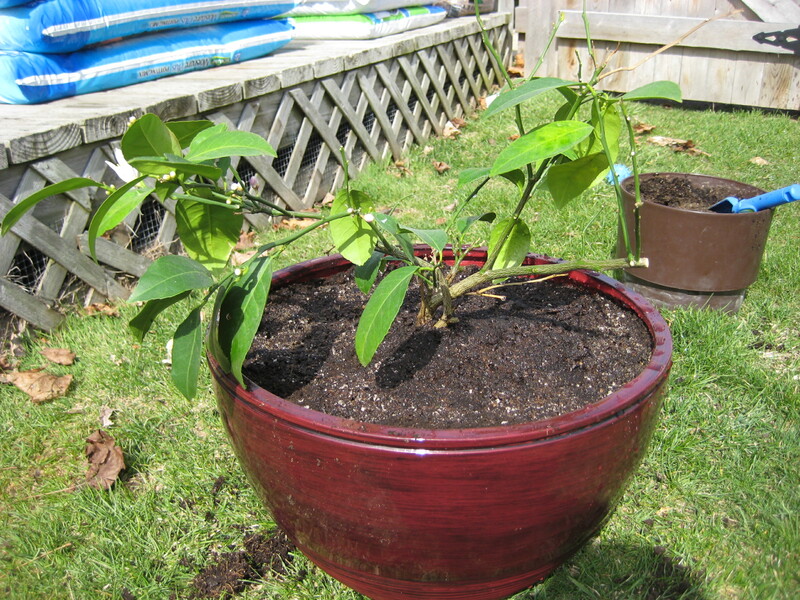 My dwarf meyer lemon tree came with the instructions to repot annually. This being the tree’s third spring with us, we are on our third pot. The pot is big this time! One more size up and I’ll have to hire movers to haul the thing in and out of the house for me. 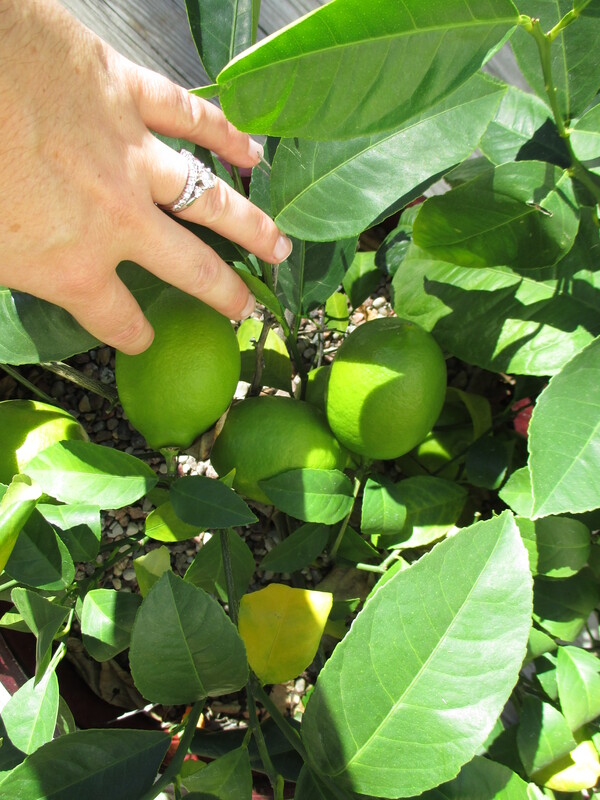 I’ve reported on this lemon tree before: When life hands you one lemon… and suffice to say the lemon tree and I have had our ups and downs. But I’ve been looking forward to this annual tradition of repotting. 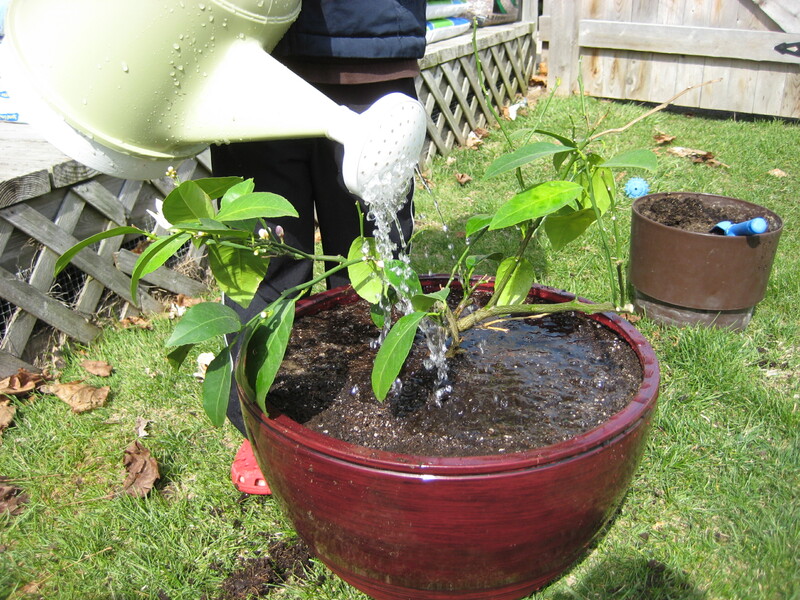 For one, I wanted to put them lemon tree in a more attractive pot. I found a very nice brick red pot at my favorite gardening store, Stein Gardens and Gifts. It’s a Wisconsin chain, so you won’t find them elsewhere. But if you do come to Wisconsin it’s worth checking out. My lemon tree has suffered from a few issues. 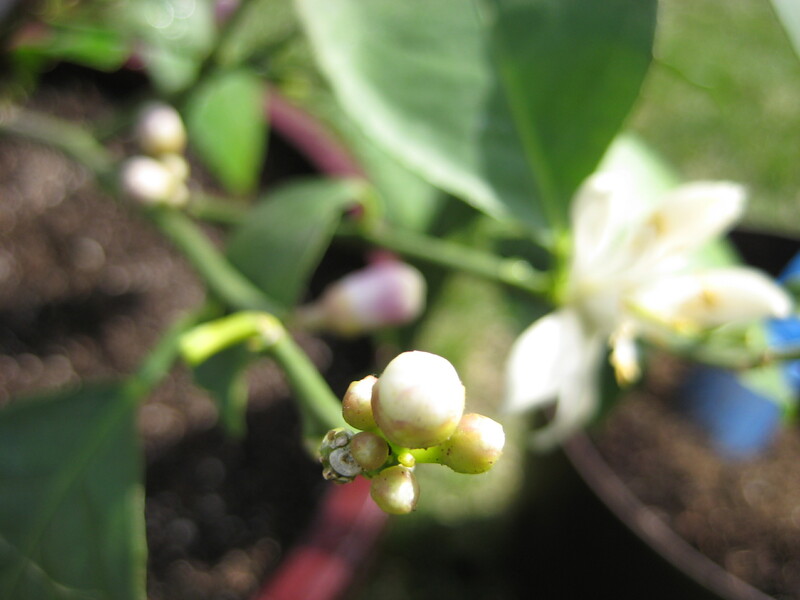 For one, it sets blooms but then they all fall off and I am left with no lemons. 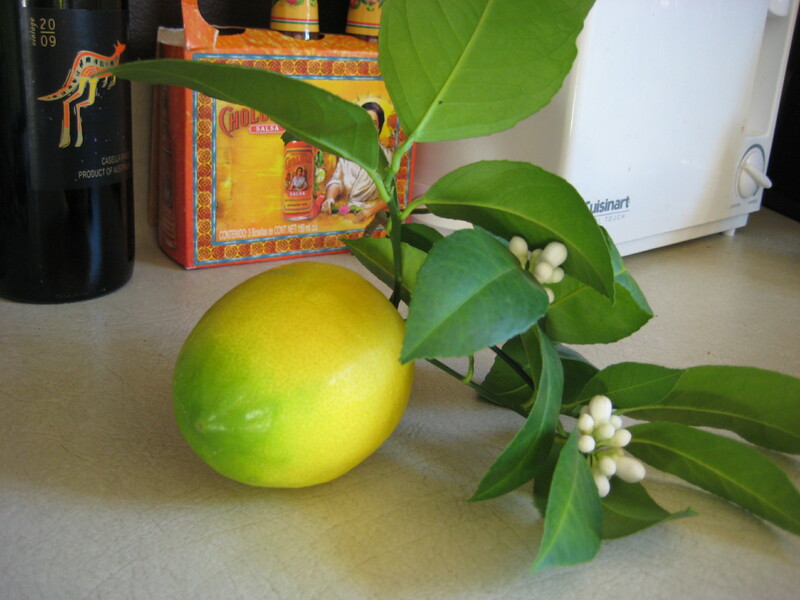 I’m not sure why this happens, but I’ve heard that this is a problem for many indoor lemon tree growers. The other problem is that it sheds it leaves a few times a year. I’m not sure it can get the energy it needs from the sun with so few leaves to soak it in. 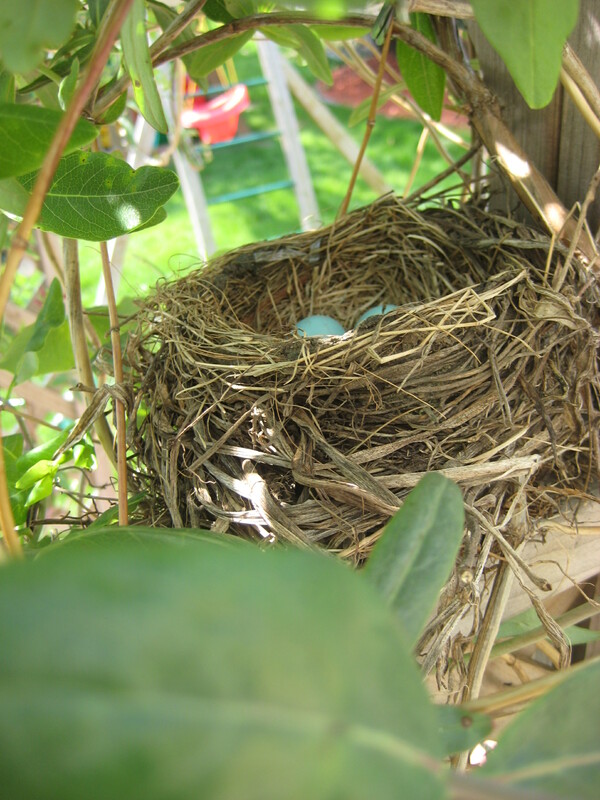 To address the blossom problem I’ve decided to beef up the tree’s food supply. 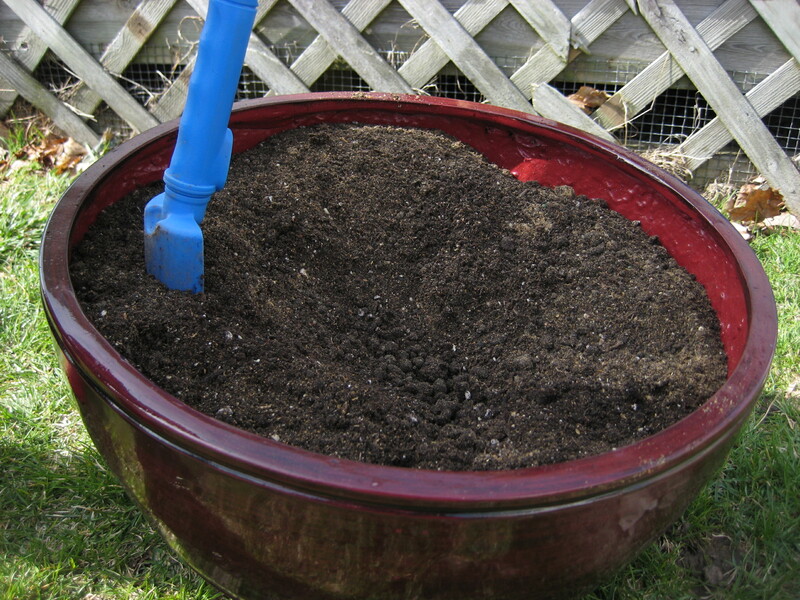 As I put potting mix into the new pot, I added several cups of organic fruit fertilizer. I am hoping that this will strengthen stem development because it seems that the stems supporting the blossoms just wimp out and break. Just so you all know, this is my non-scientific totally untested solution to this problem. As I’ve said before I work more on a “feel” basis. I have no idea if this will work or not. 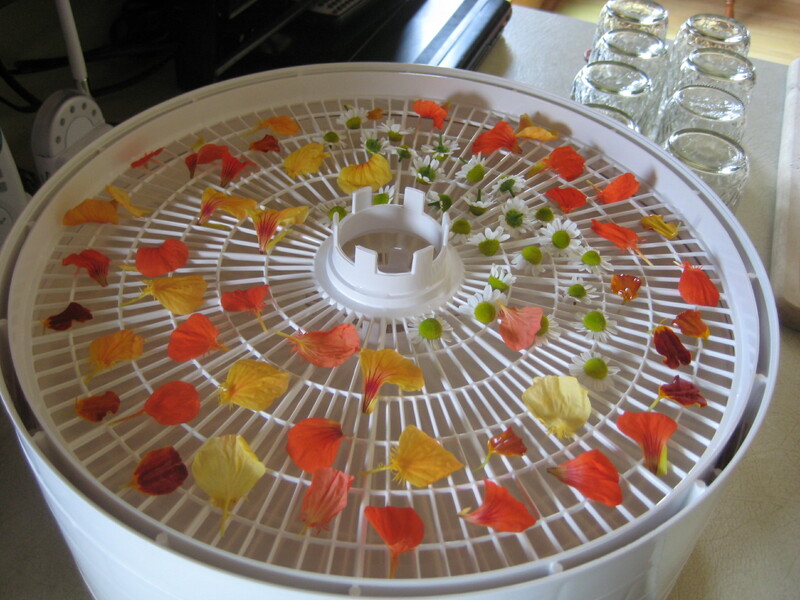 But after months of watching blossoms fall off my plant, it seems like the right thing to do. As for the leaves, all I can hope is that the weather around here warms up and the tree can go back outside. 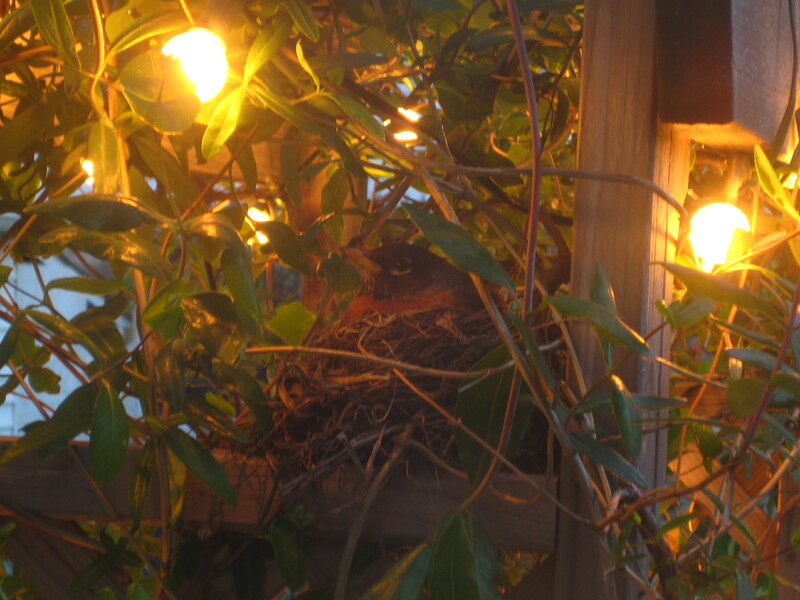 I know how this tree feels–cooped up in this house all winter getting a fraction of the sunlight it needs or desires. I understand wanting to just sadly drop your leaves and look pathetic. And it does look pathetic. 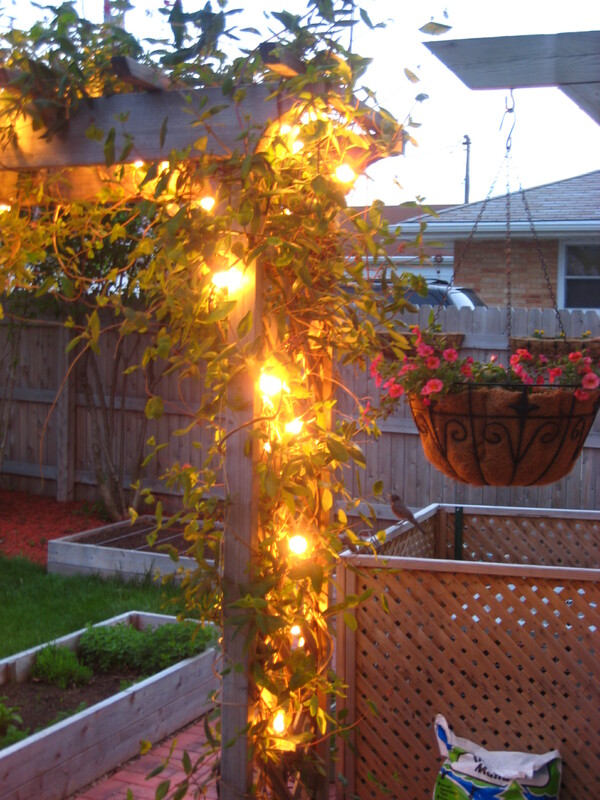 I’ve been taking it outside when weather permits. I’m hoping soon it can just stay out there. Especially since this new pot is so heavy! 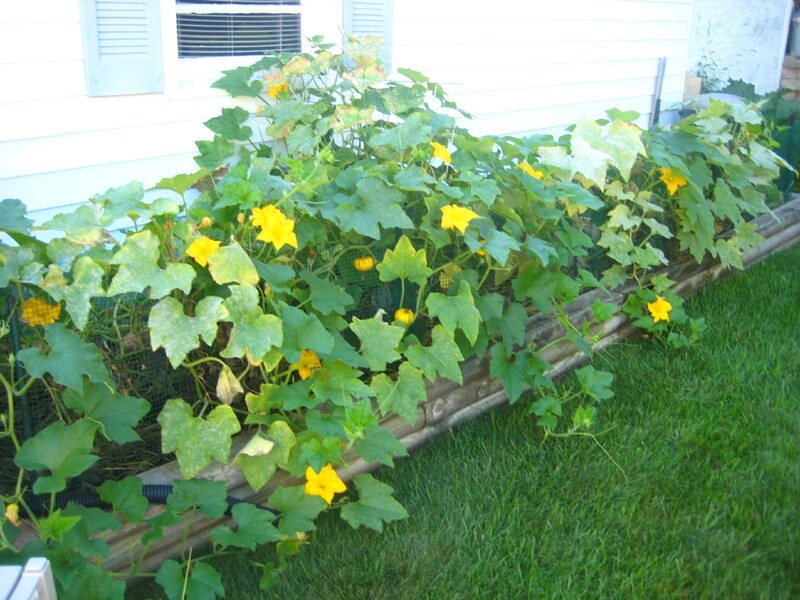 I used an organic fertilizer in conjunction with some “moisture plus” potting mix. 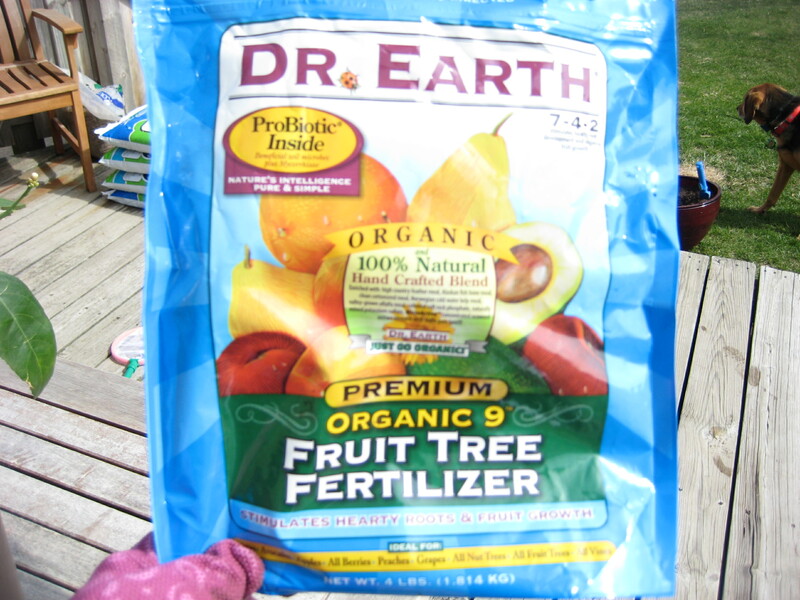 I used Dr. Earth organic fruit fertilizer. 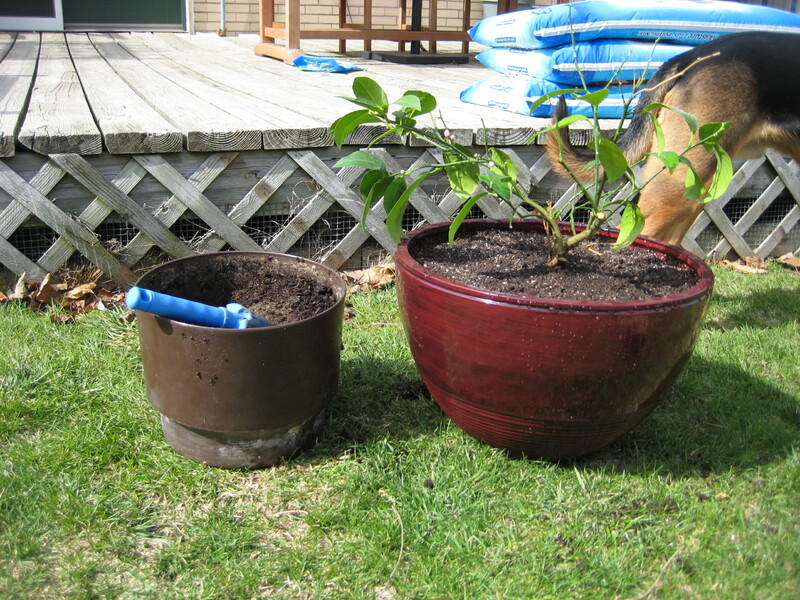 I blended the fertilizer with some fresh potting mix to fill the new pot, leaving some room for the lemon trees root system. When I took the tree out of its current container I noticed a lack of large roots. 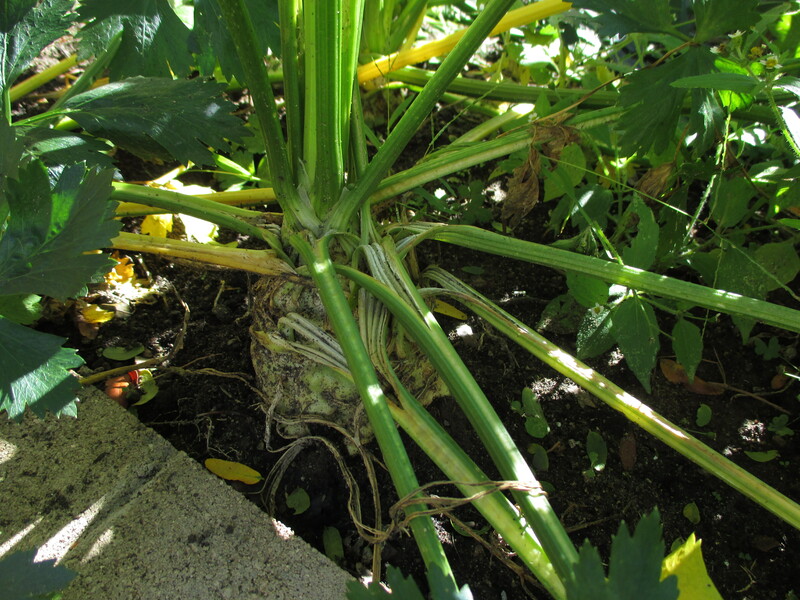 There was a system of smaller roots, but as I moved the plant out of the pot many of them broke free of the tree. I hope I did not cause too much stress to the tree. I tried to be gentle! 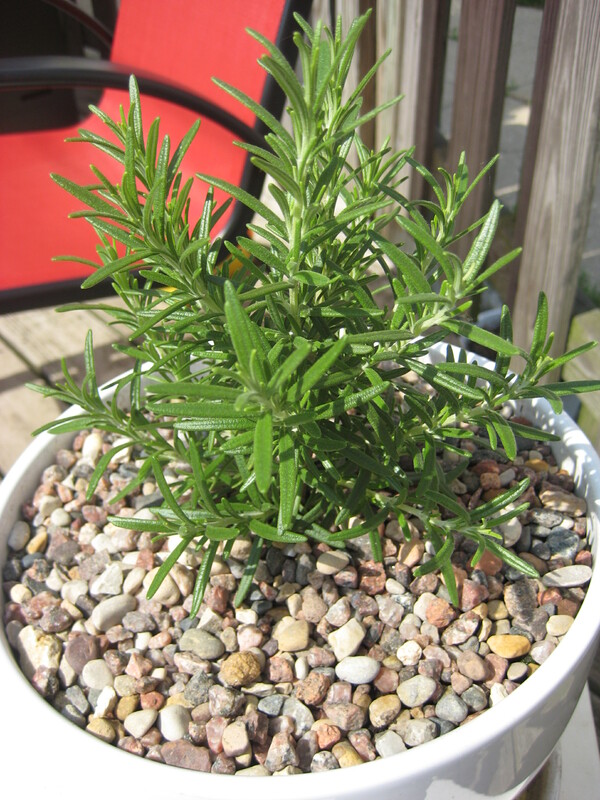 Perhaps the new pot, fertilizer and potting mix will invigorate the root system. My son waters in the lemon tree. My new pot is a few inches wider in diameter than the old one. This new brick red pot is certainly an upgrade! 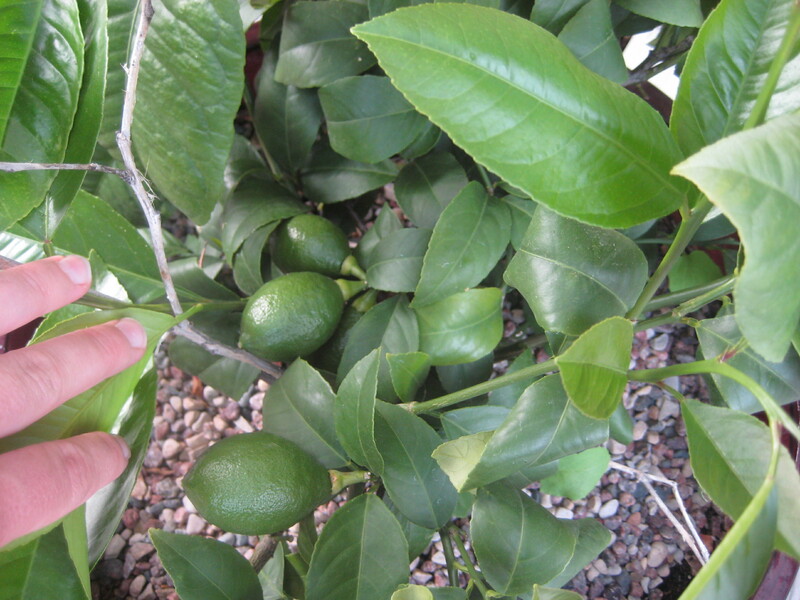 Something that bothers me about my lemon tree is a lack of a central trunk. Maybe this is normal? Leave a comment if you know anything about this. 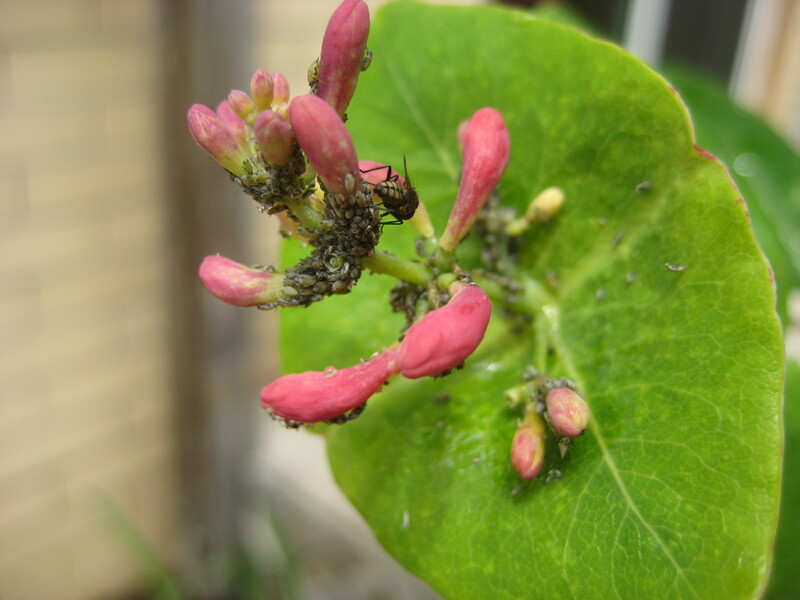 I’m hopeful that the blossoms that are on the tree now will turn into lemons, at least a few of them! 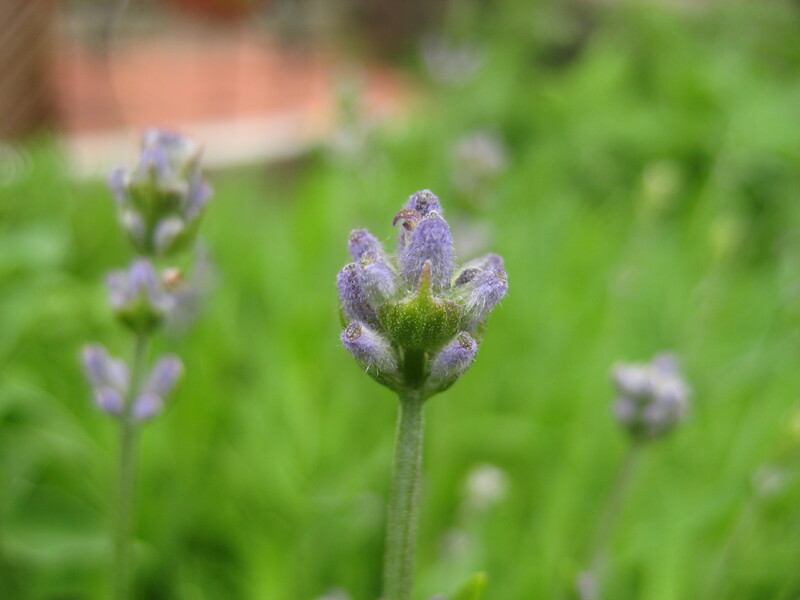 They will certainly benefit from being outside where the bees can help them along, the sun can warm them and the breeze can make them strong. The new pot with its healthier blend of potting mix should certainly be a help as well. And now that the tree has more room to grow, it can support more fruit. Im cheering these blossoms on! 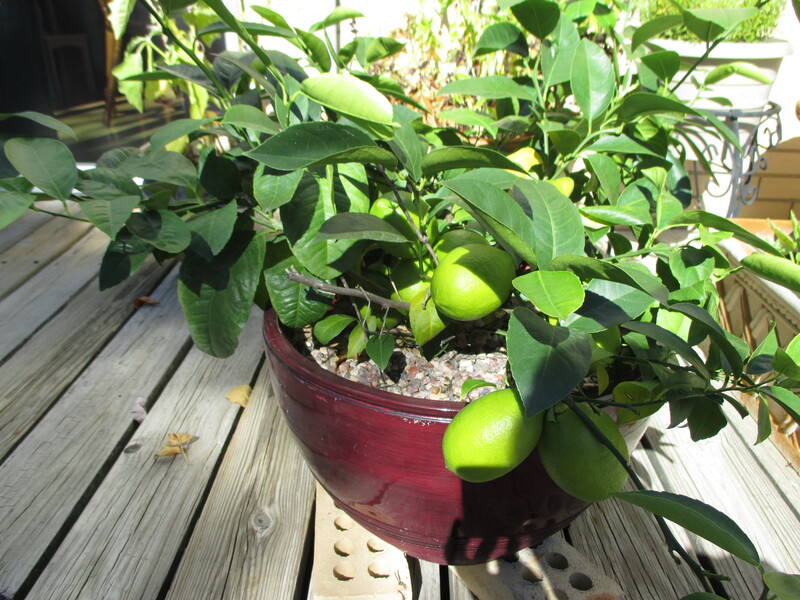 Well, little lemon tree… it’s up to you now! Looking happier already, the lemon tree is getting settled into its new home. 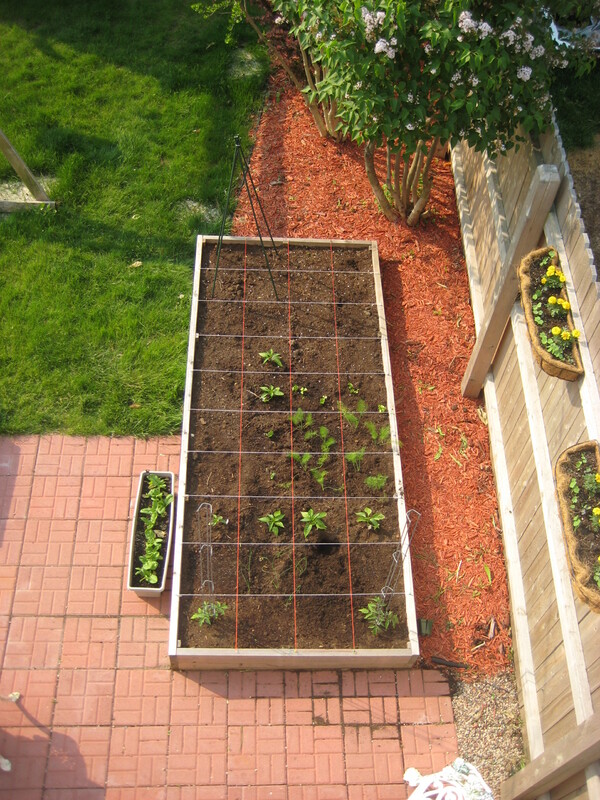 So many tomato transplants, so little space. We live in the city which can be very convenient. 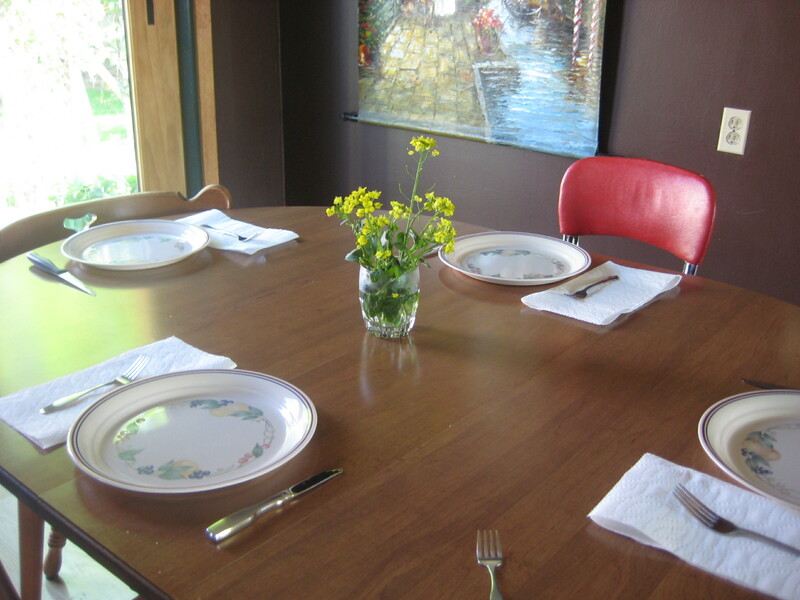 Who wouldn’t want to be 5 minutes from downtown dining, professional sports, museums and theatre? Not to mention our proximity to Lake Michigan… I can walk there in ten minutes! 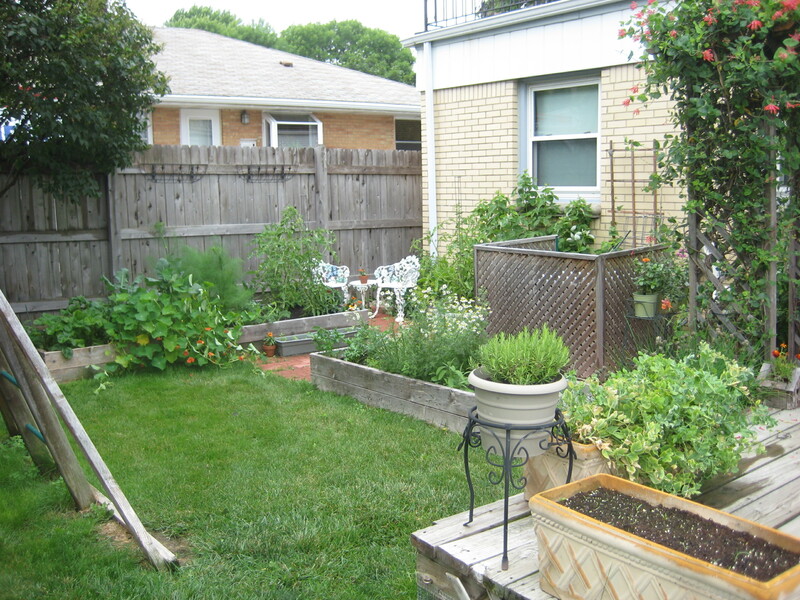 But what city dwelling lacks is gardening space, and for a gardener that can be kind of annoying. I am learning to work with my space. And I’m learning restraint. It’s time to order tomato seeds, and while I am drooling over the gorgeous photos in the seed catalogs, I’m reminding myself that my garden can only handle 4-6 tomato plants. 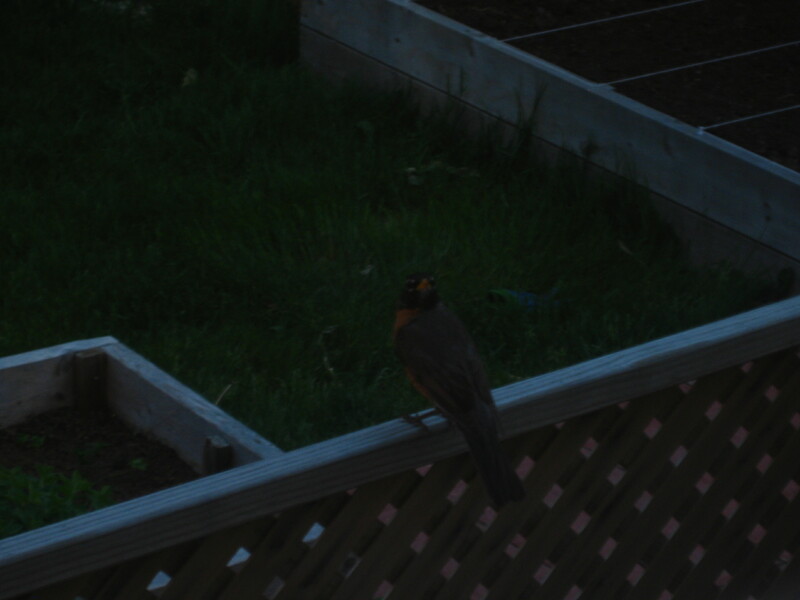 So don’t go ordering all those tomato seeds! 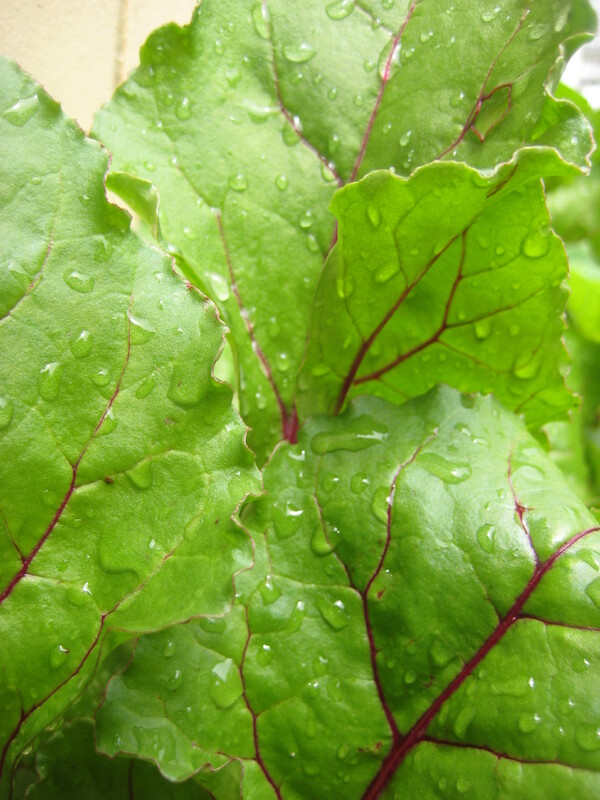 It’s hard to resist the countless varieties that all hold their own promises of flavor, texture and beauty. I want them all. Here’s the plan for 2011, which is (as always when it comes to gardening) subject to change at any time. 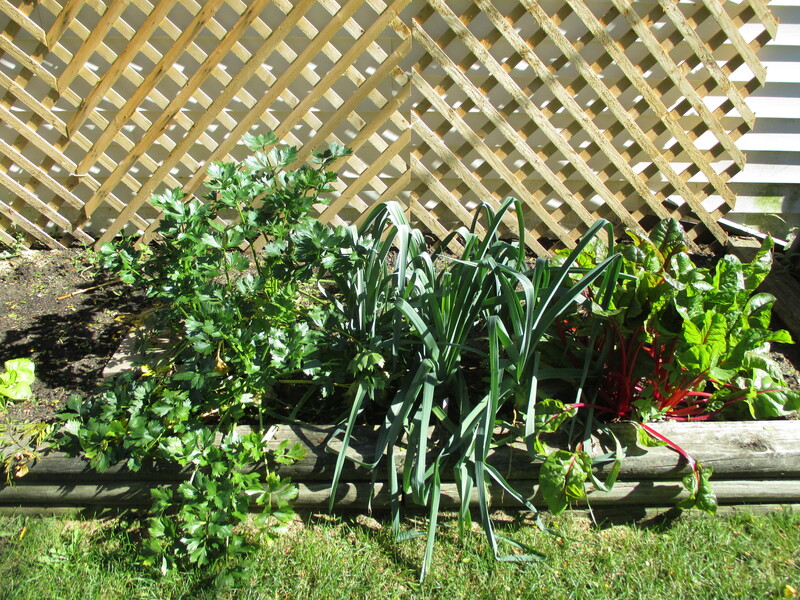 I will put four plants into my raised vegetable bed as I did last year. 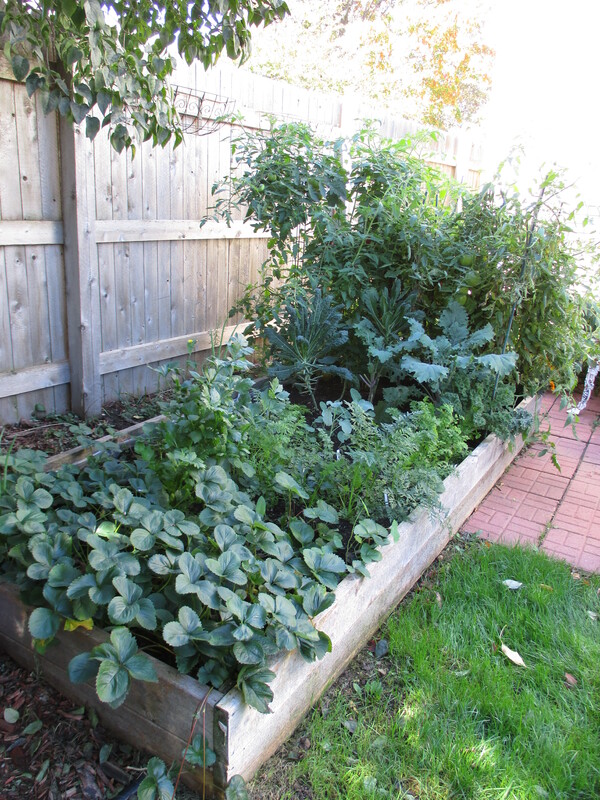 It’s easy to access the plants on the corners of the raised bed. 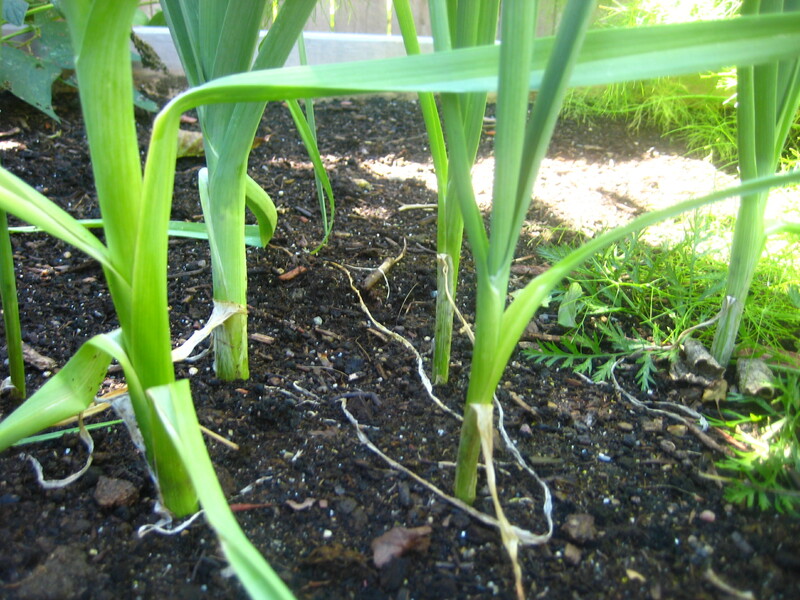 I will put two additional plants in nearby pots, and hope for the best. 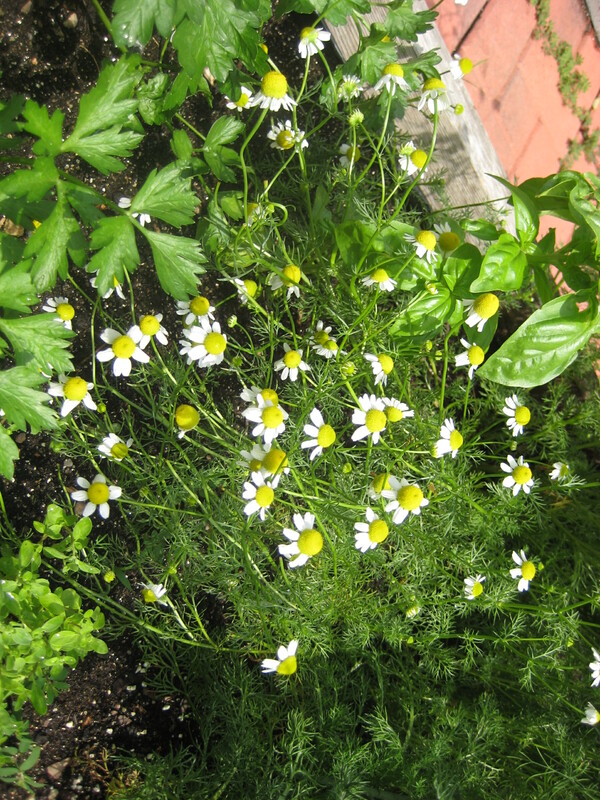 I’ve planted in pots before with mixed results. The key is consistent watering. Same thing with the Topsy Turvy, but I’m not going there this year. These descriptions are straight off the websites from which I’ve purchased the seeds. Outstanding heirloom from Italy. 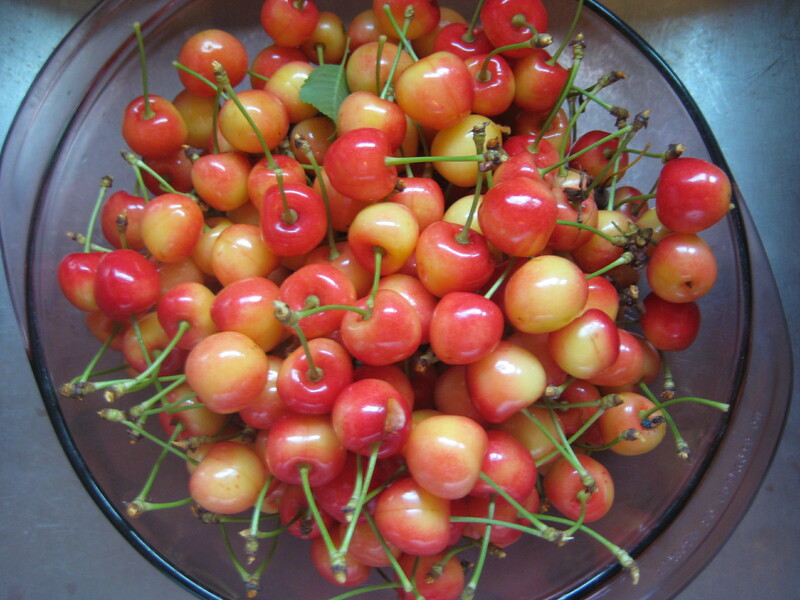 Plants are loaded with red fruits weighing over a pound. 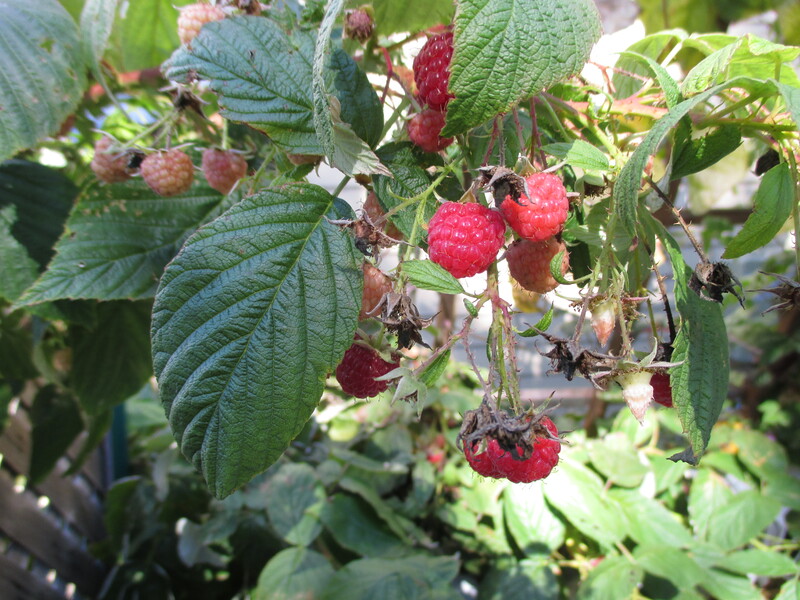 One of the most productive varieties we have grown at Heritage Farm. Excellent full tomato flavor. 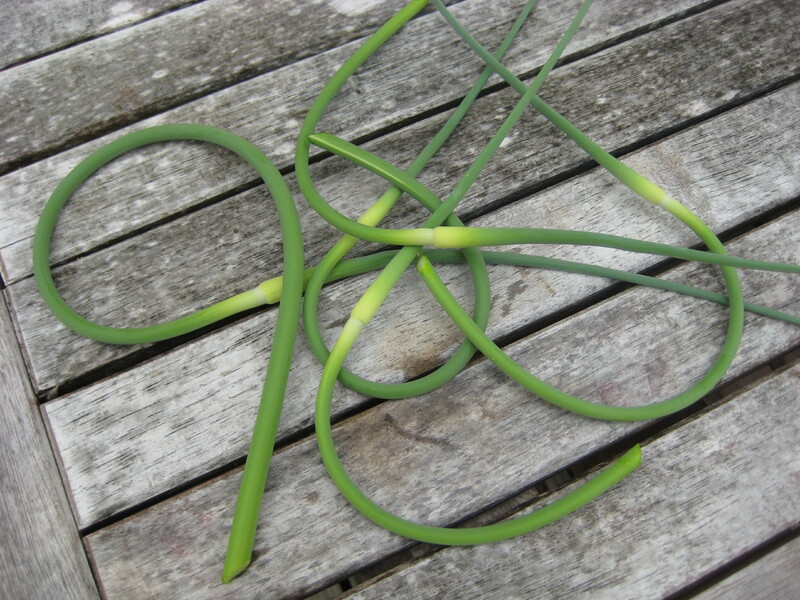 Ideal for slicing and canning—very little waste and easy to peel. Indeterminate, 70-80 days from transplant. 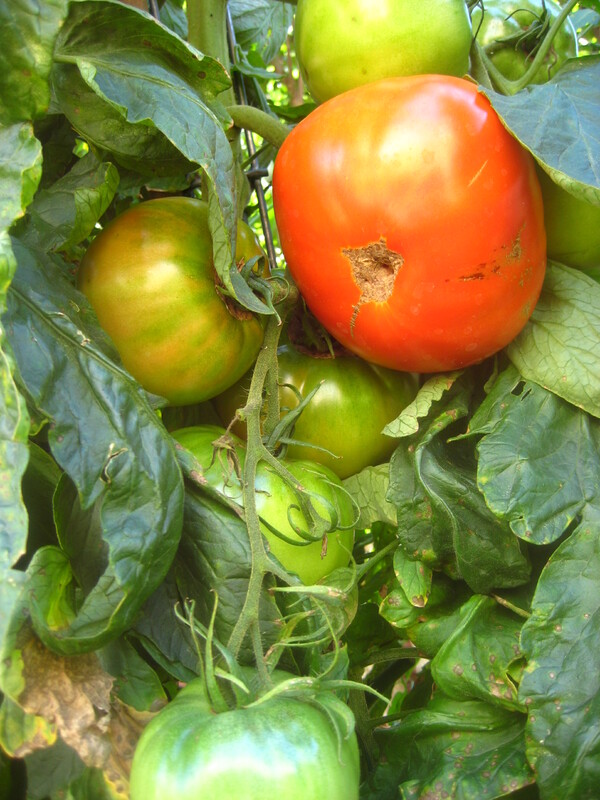 The “ultimate love apple” according to Amy Goldman’s colorful story in The Heirloom Tomato. 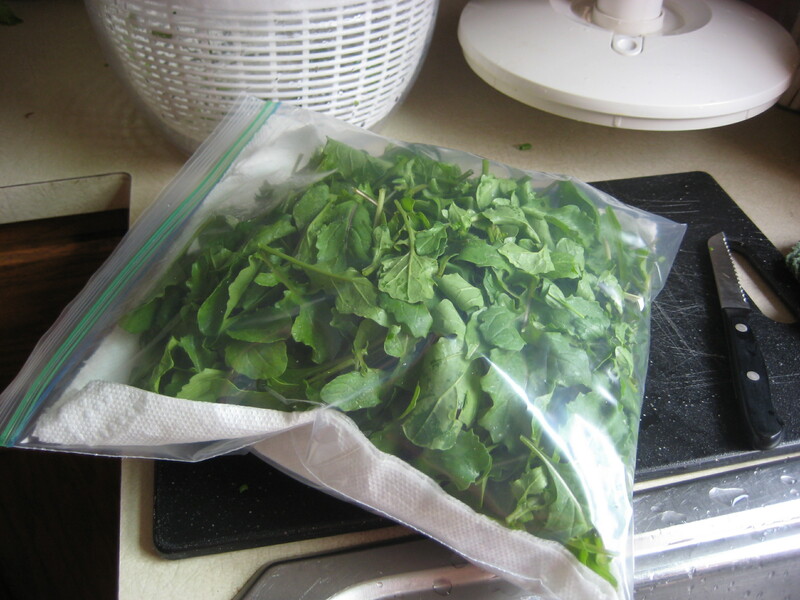 Nebraskan brides reportedly still receive these seeds as a wedding gift. Listed in the 1983 SSE Yearbook by Dorothy Beiswenger of Crookston, Minnesota. Reliable producer of stunning 4″ round fruits with glowing orange skin. Well-balanced flavor. 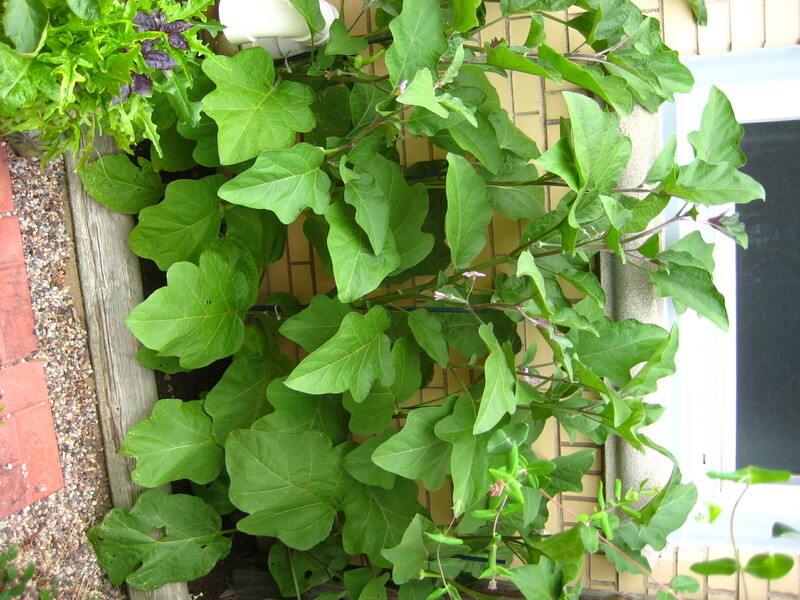 Plants typically grow less than 36″ tall, but benefit from staking. Determinate, 85-90 days from transplant. Exceptionally vigorous plants yield hundreds of large red cherry tomatoes throughout the season. 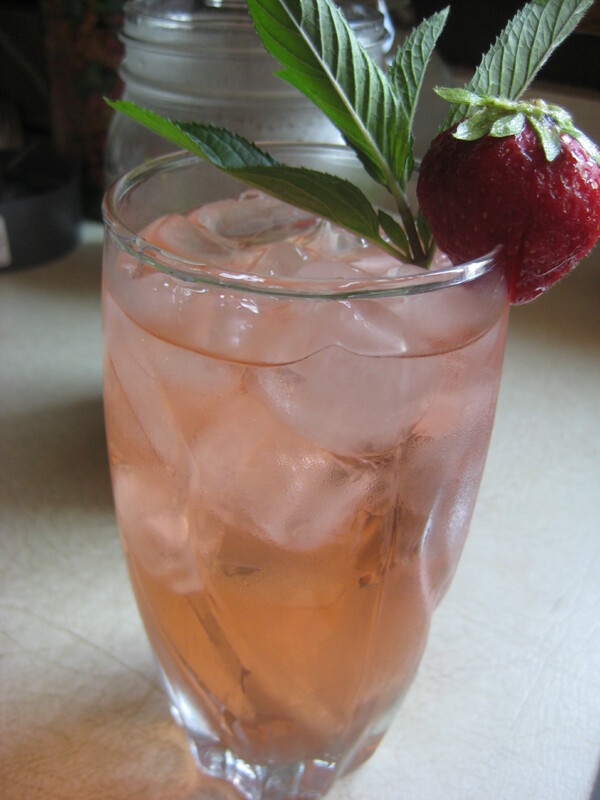 The superb flavor won it top billing over 100 other varieties in an Australian taste test. Indeterminate, 70 days from transplant. Bred by JC Walker at the University of Wisconsin in the 1940s. Excellent all-purpose tomato, great for canning. Does best on rich soils. Remembered as one of the best home and market tomatoes in the Madison, Wisconsin area. Indeterminate, 80 days from transplant. One of my favorite tomatoes. Beautiful chartreuse with deep lime-green stripes, very attractive. 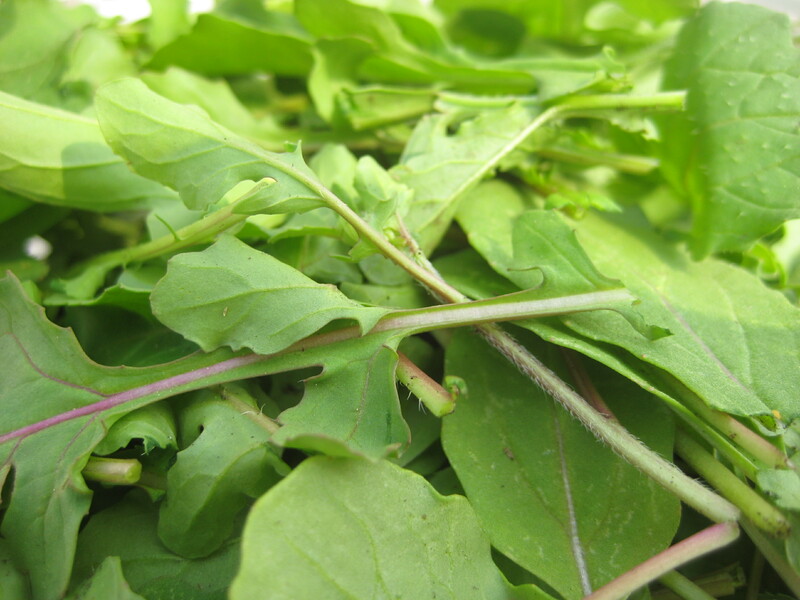 Flesh is bright green and very rich tasting, sweet with a sharp bite to it, (just too good to describe!). 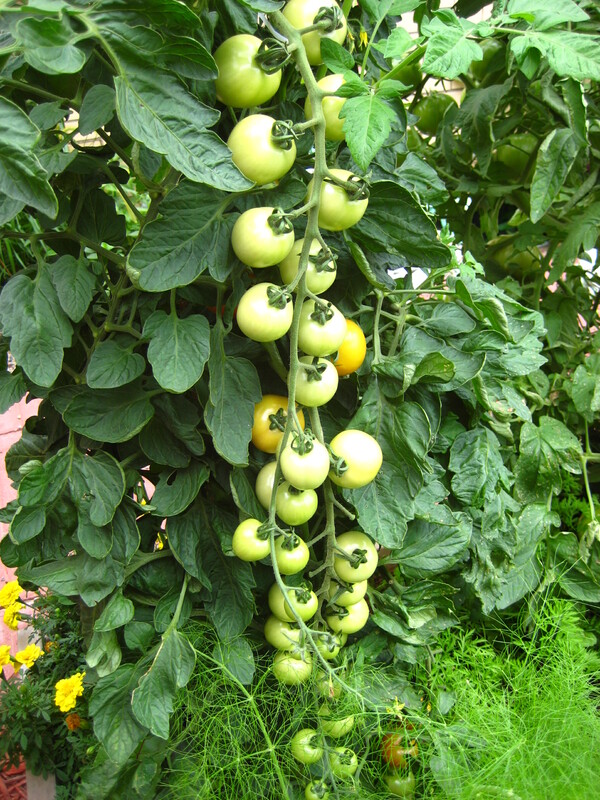 A favorite tomato of many high class chefs, specialty markets and home gardeners. Yield is excellent. The most striking tomato in our catalog, a real beauty. Around 3 ounces each. stripes. One of the most unique looking tomatoes we have ever tried. It is very sweet and yet has a full-rich flavor, and this is the reason this tomato places very high in taste tests. A favorite here with the staff at Baker Creek. Fruit is medium to large and are of a slightly flattened globe shape. Wow! Sounds like a delicious summer is ahead. These tomato descriptions make my mouth water. I simply can’t wait for that first taste of a garden tomato. 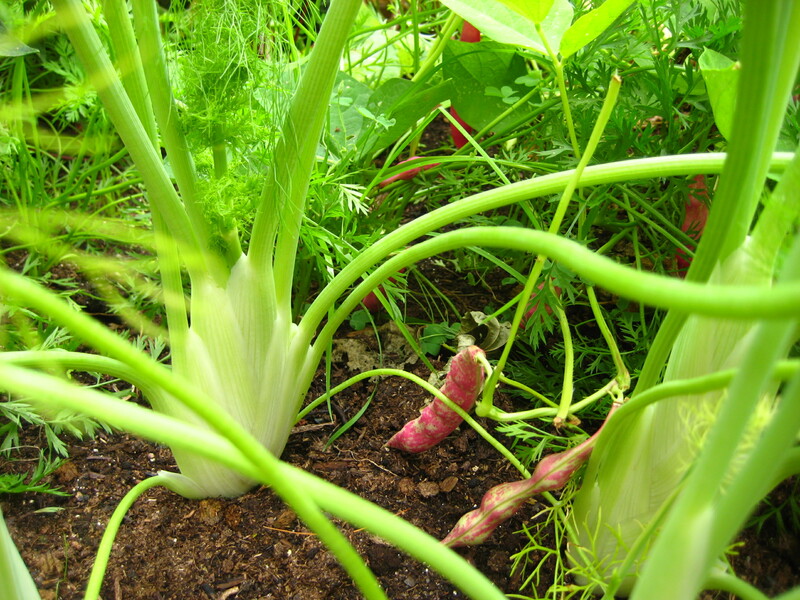 For quality seeds and incredible variety: Baker Creek Heirloom Seeds or Seed Savers Exchange. Cherokee Purple tomato prior to ripening. 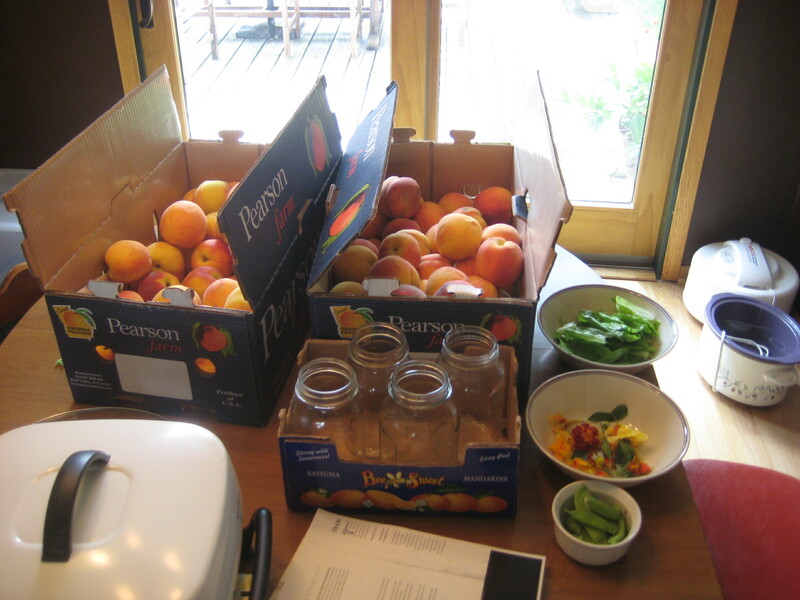 Perhaps nothing says “summer garden” more in this country than that ubiquitous garden veggie–er, fruit–the tomato. 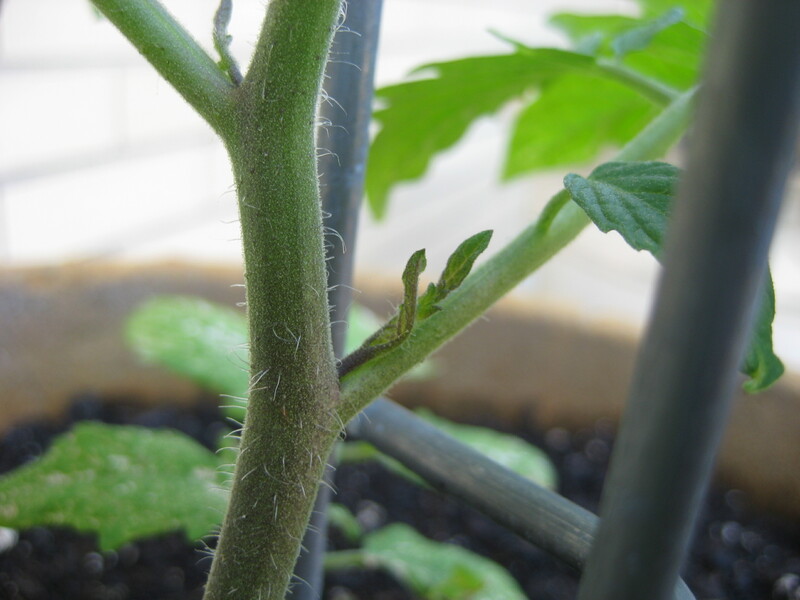 Even those who grow nothing else might consider a tomato plant in a container, because as we’ve been told a thousand and one times: There is nothing better than a fresh picked tomato right from the garden. And as oft as that phrase has been spoken, it really is true. Garden tomatoes are good. Really good. 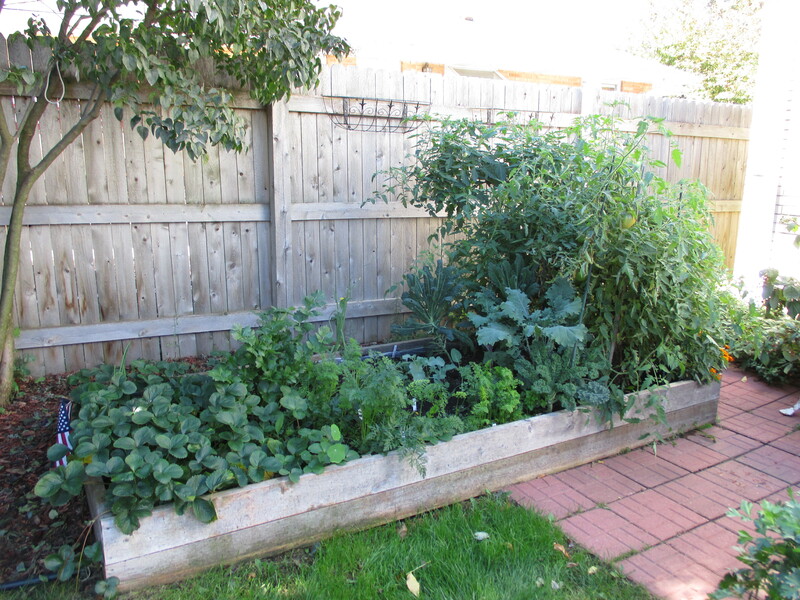 I only have room for four tomato plants in my raised beds, with a possible fifth or sixth plant lurking nearby in a pot. 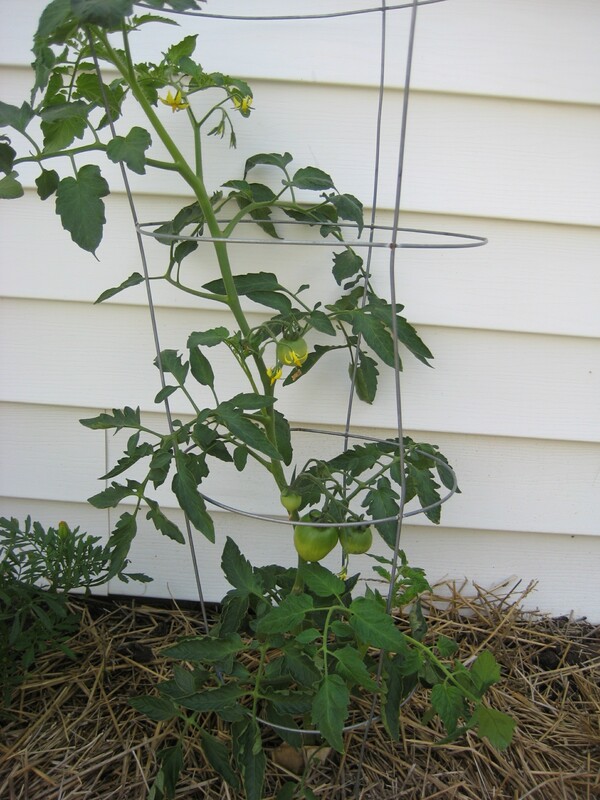 Tomato plants can be big, and many of them have a tendency to sprawl and get really tall only to collapse onto themselves when the weight of their fruit becomes more than they can support. 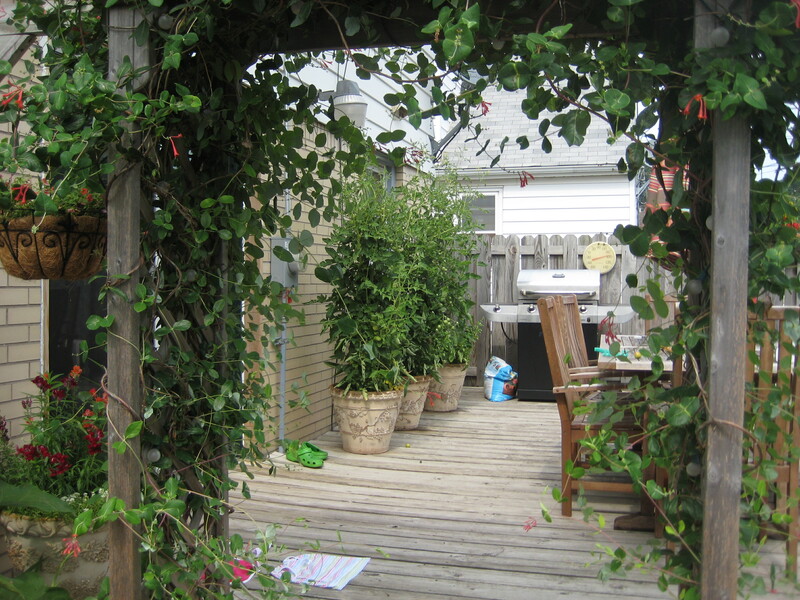 Or they get all bent out of shape during a windy summer thunderstorm and suddenly what was once a well-formed plant occupying the planned space becomes a mass of leaning and reaching vines invading other garden territories. 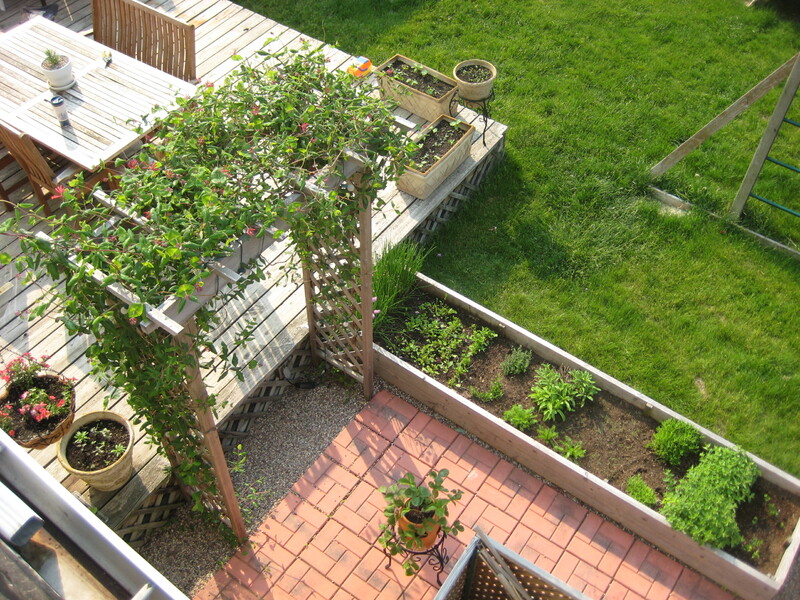 A gardener with a small space must choose wisely. And so now it’s decision time. I’m carefully reading the tomato descriptions in my stack of seed catalogs, trying to find just the right mix of 4-6 plants that will grace our garden this year. If only I had room for 20 plants! We need something big and juicy for sandwiches and burgers. 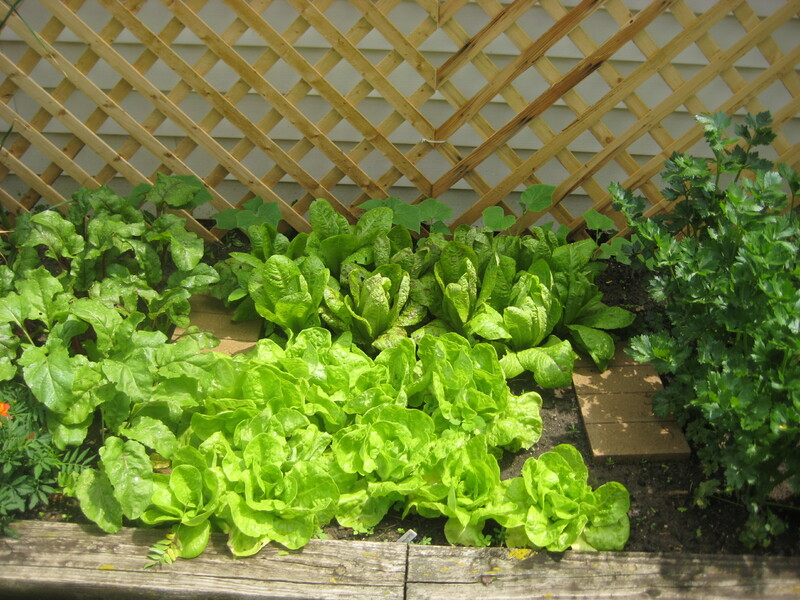 We need perfect salad tomatoes to throw in with all the salads we eat from our garden, the ones made with lettuces, spinach and greens. The other salads made with beans, grilled eggplant and peppers, or herbs. We need the ideal tomato for caprese salad. It must sing on the plate with fresh mozzarella and basil. Don’t forget the olive oil! 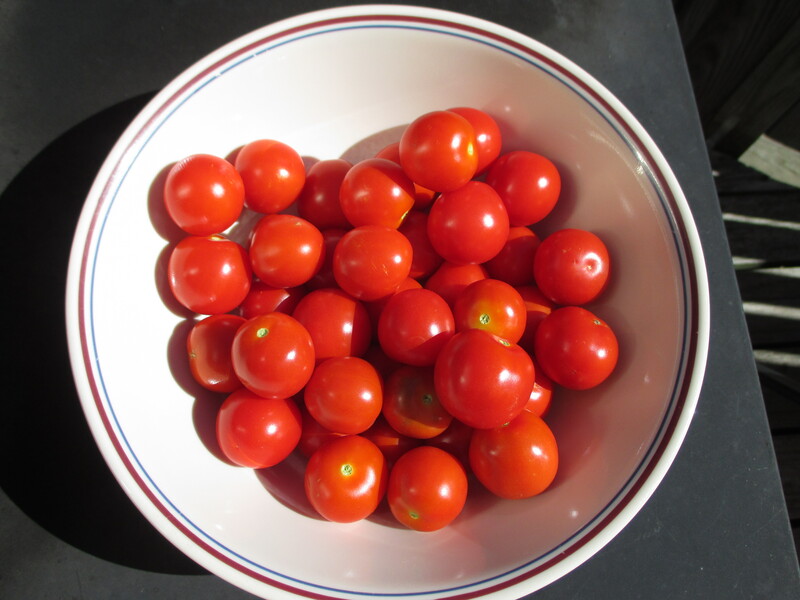 The kids will want something to pick and eat in the garden–a fun little cherry tomato. Something that is sweet with just a bit of acidity that pops in your mouth with you bite down. And then there is always the great experiment. The variety that I grow simply because I haven’t grown it before. Something unique, heirloom, loaded with promise. This is the tomato for the gardener. 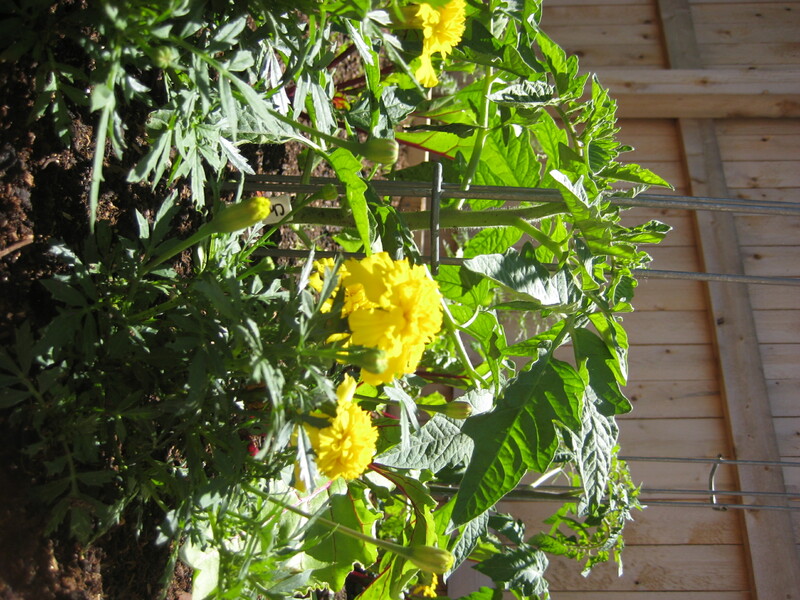 Being 50% Italian, it grieves me to grow a garden void of paste tomatoes. 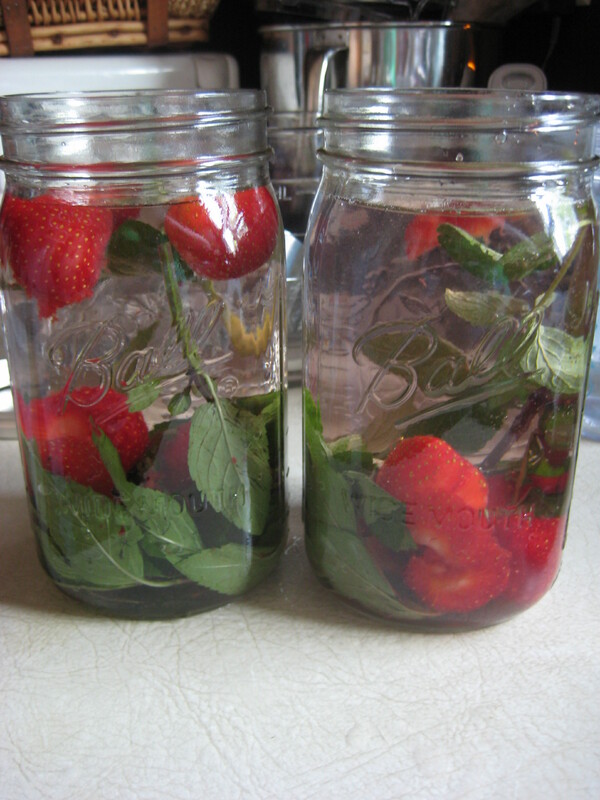 I long to grow enough tomatoes to make and bottle (or freeze) sauce. 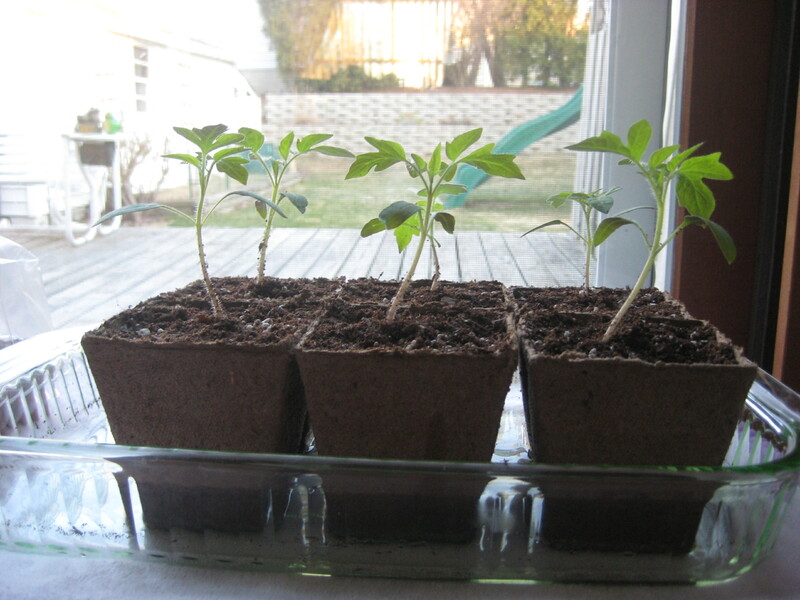 Two years ago I attempted to grow a few paste tomato plants, only to have the weather thwart my plans. I felt like I could have used my space more wisely, and so from now on I will. But I will hold onto my dream of a large harvest of San Marzanos or Amish Pastes. I have a feeling this is in my future someday. Sapho tomatoes cascading on the vine. A family of Gurney Girls making the transition from green to red. 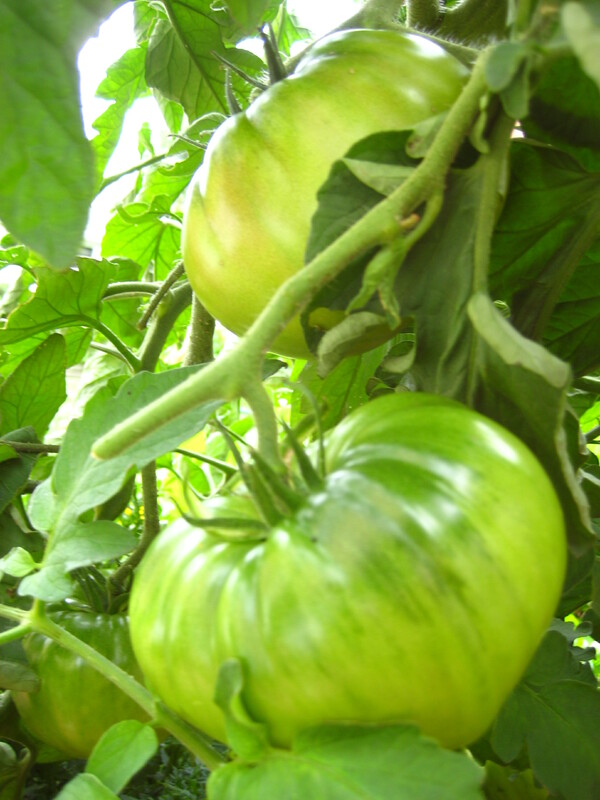 A Beefsteak tomato plant of 2009. These tomatoes are like the exclamation point on this bowl of garden veg.